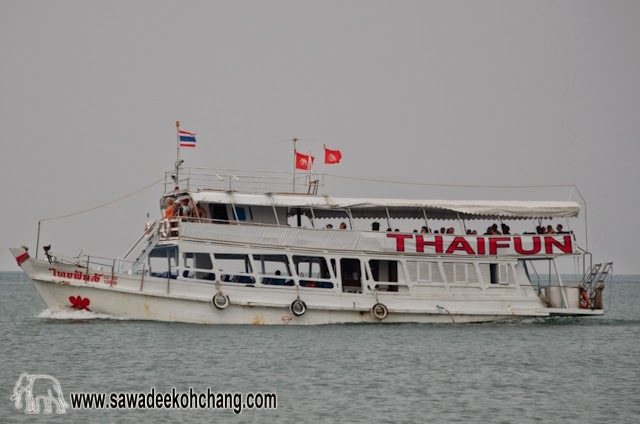 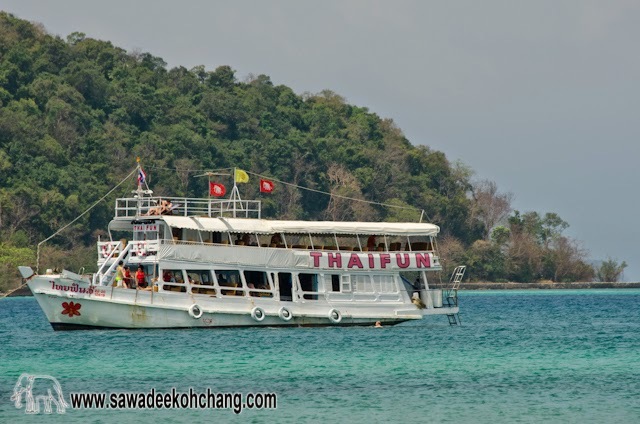 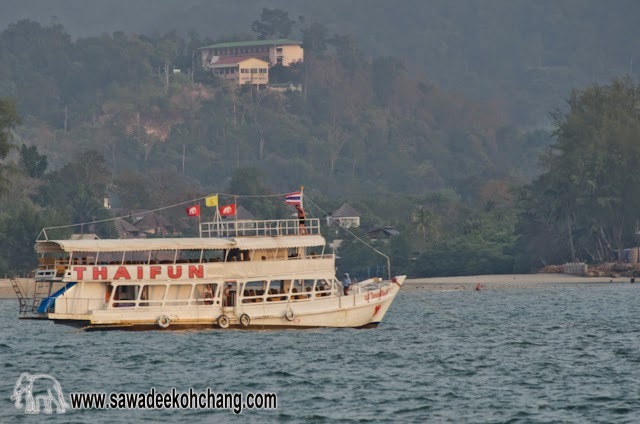 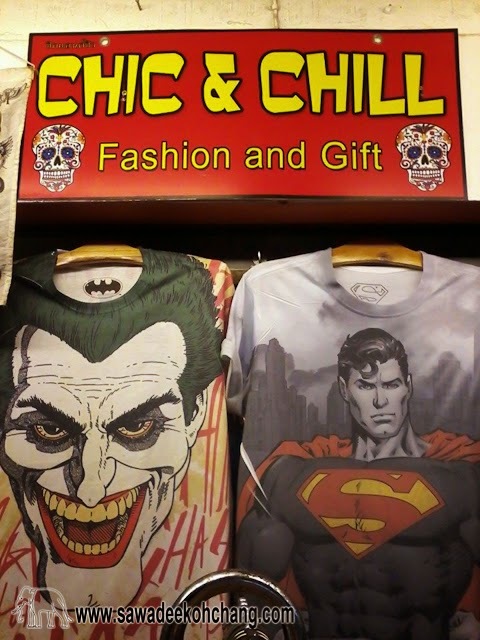 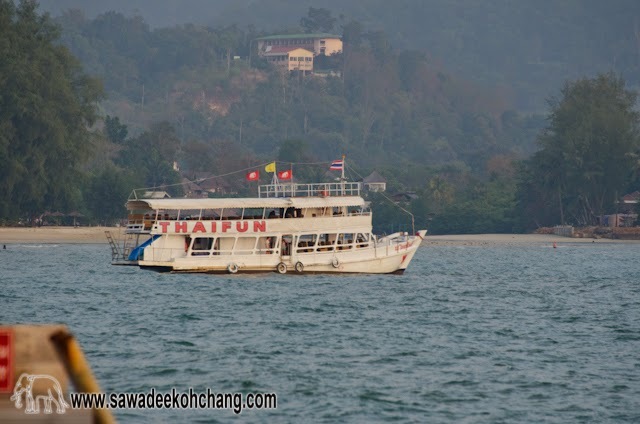 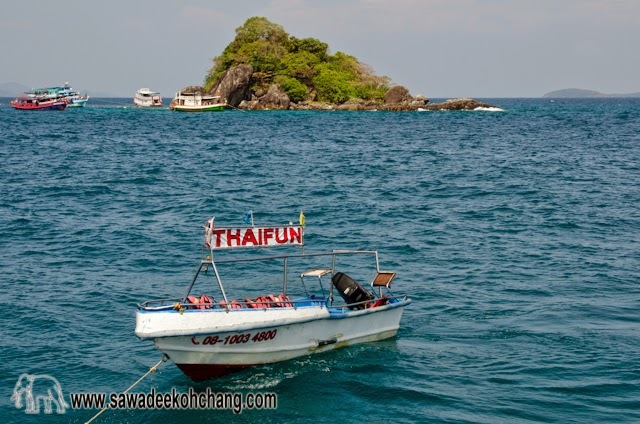 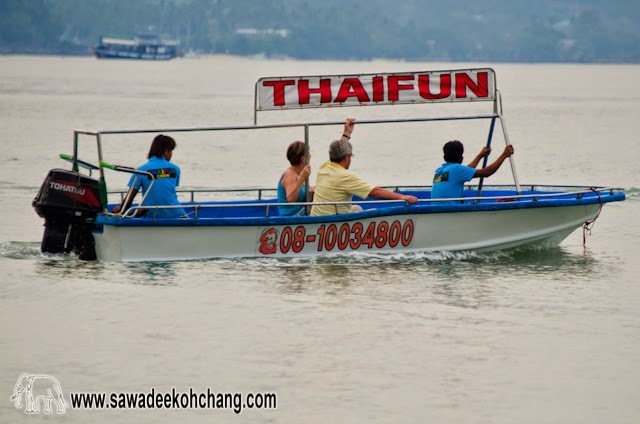 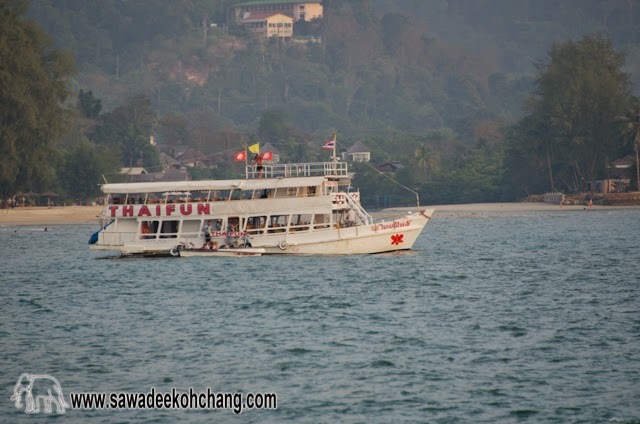 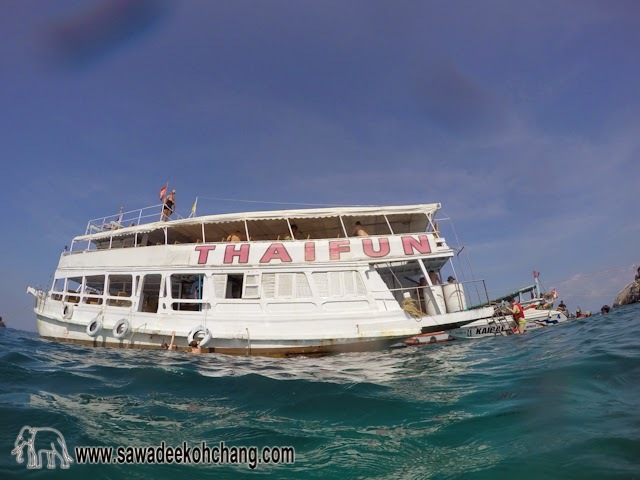 Thaifun is my favourite attraction in Koh Chang but it's also the most known. 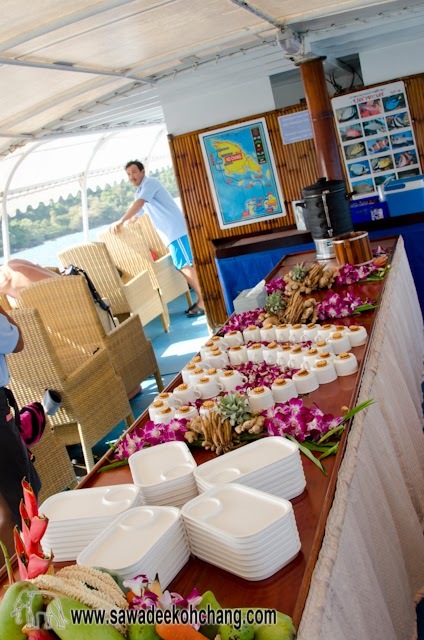 If you want to spend a relaxing day with adventure, discovery and fun in a comfortable boat, this is made for you. 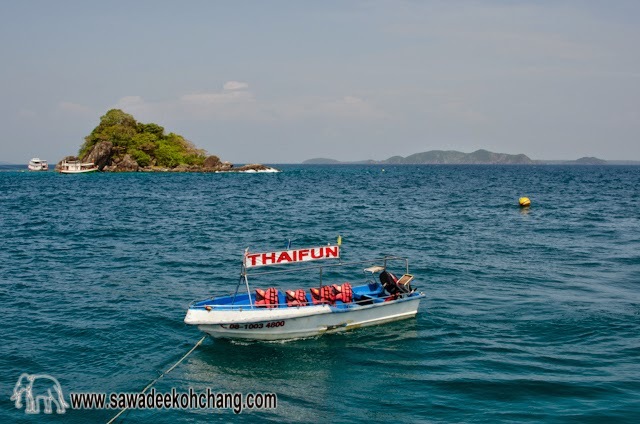 You can book this trip from any place on the island, travelling agencies or resorts, everybody knows Thaifun. 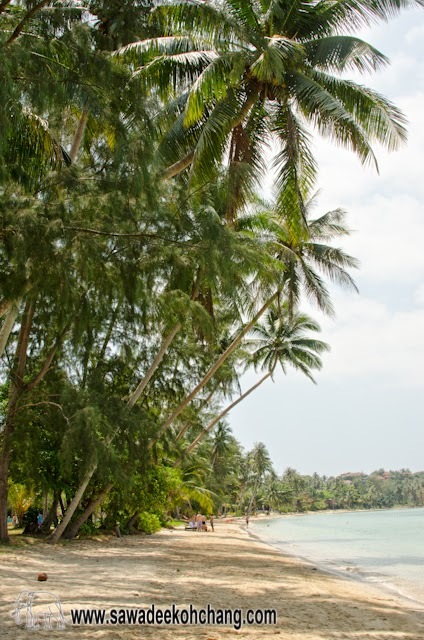 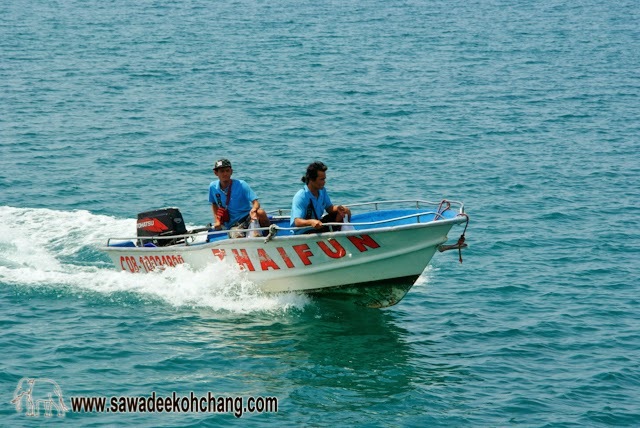 If your resort is on a beach side, Thaifun will pick you up directly from the beach. 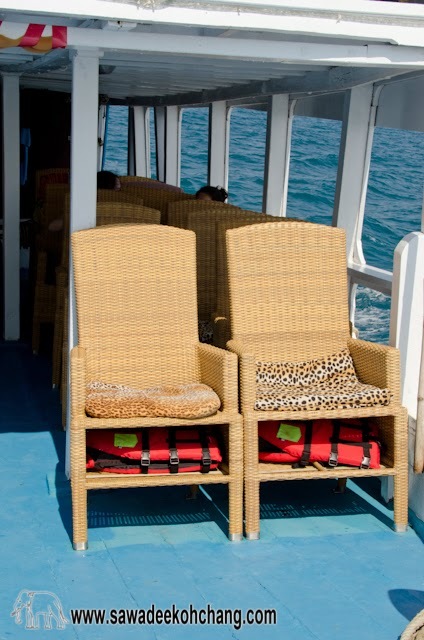 Otherwise they will pick you up with their minibus and bring you to the closest beach. 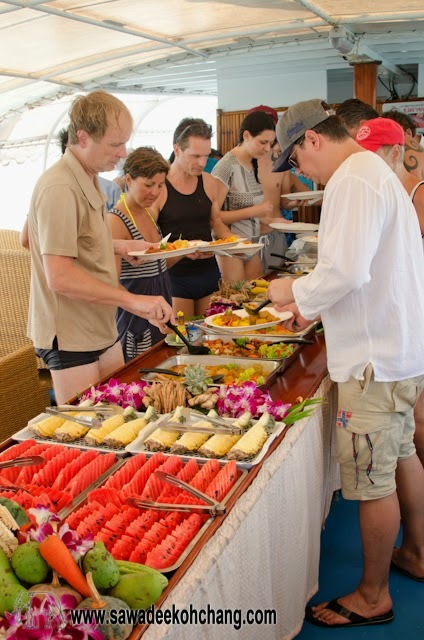 The trip starts in the morning, so wake-up a bit earlier to have time to take your breakfast. 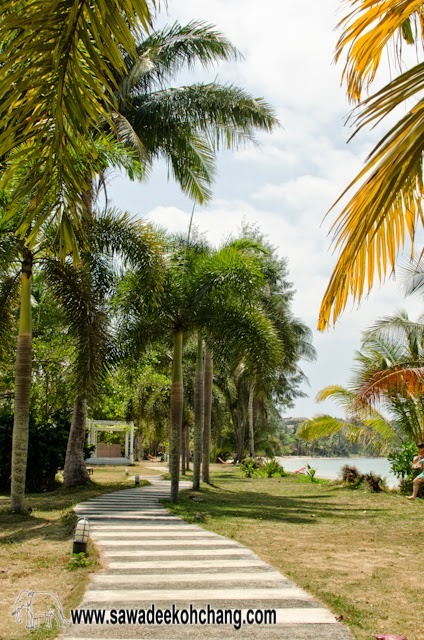 Take a towel, sun lotion and your camera. 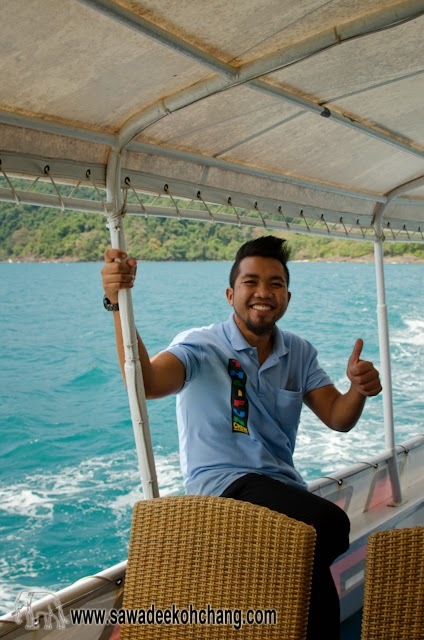 Your day will start with smiles immediately at the pick up. 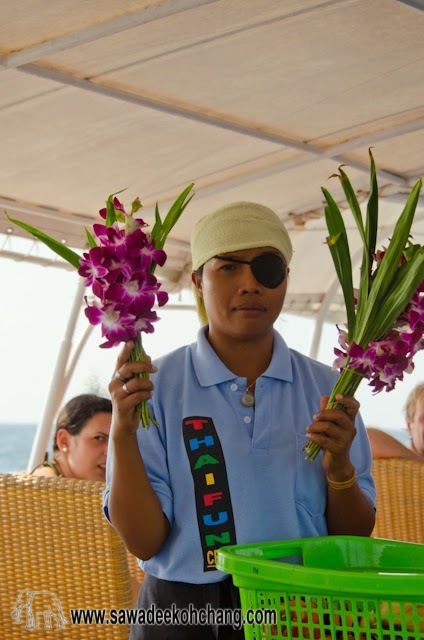 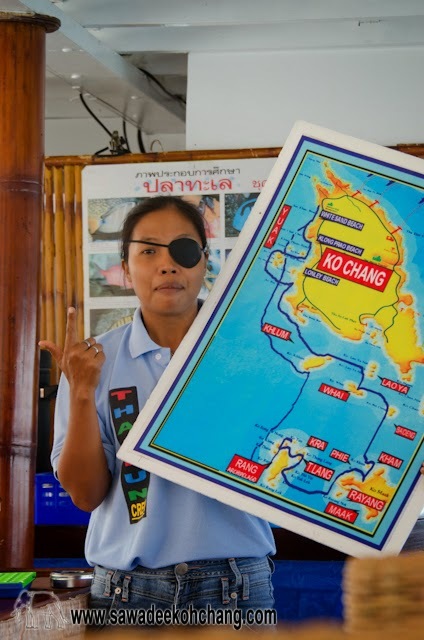 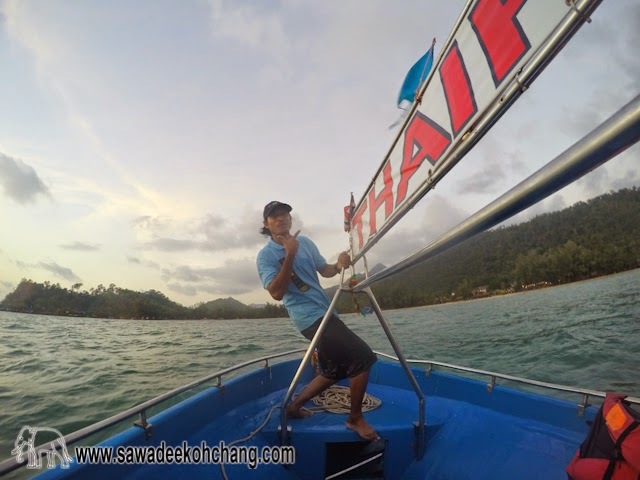 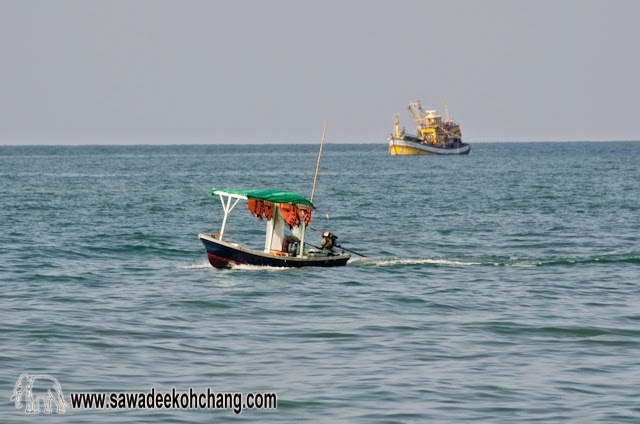 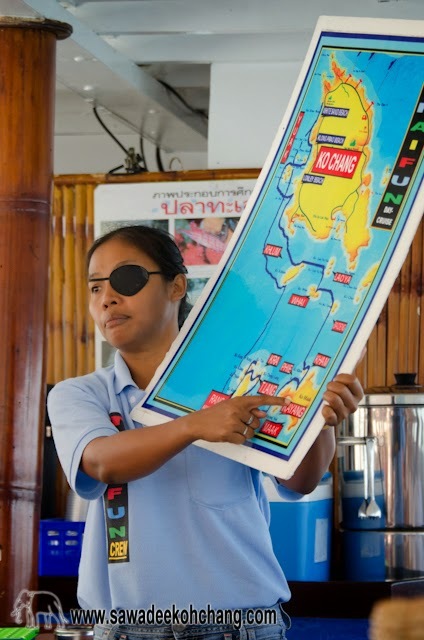 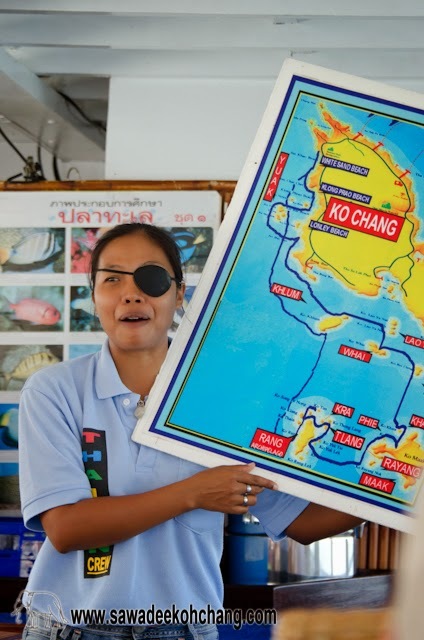 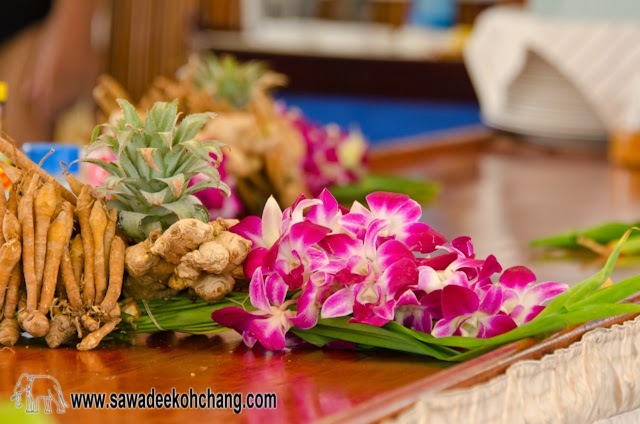 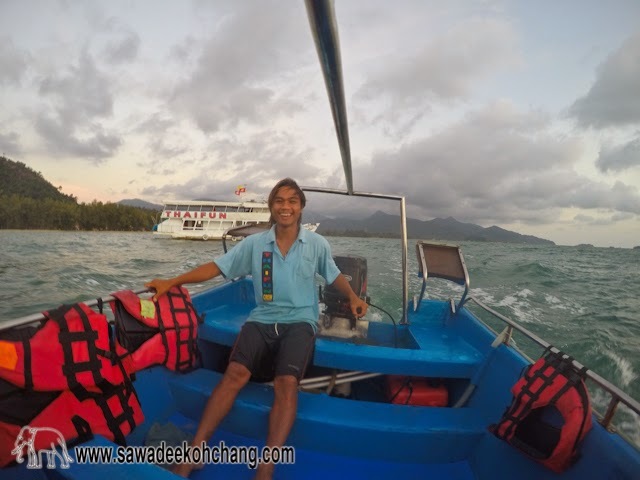 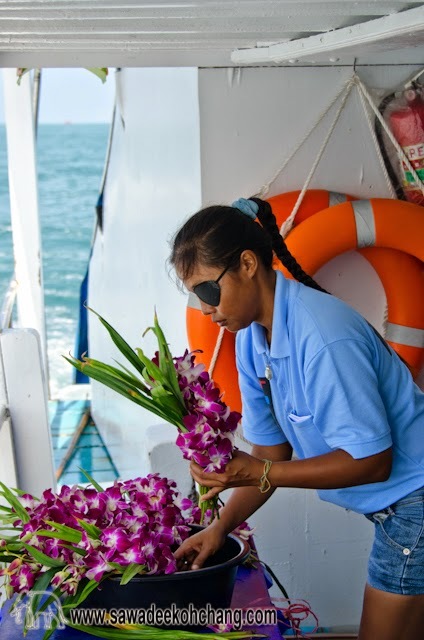 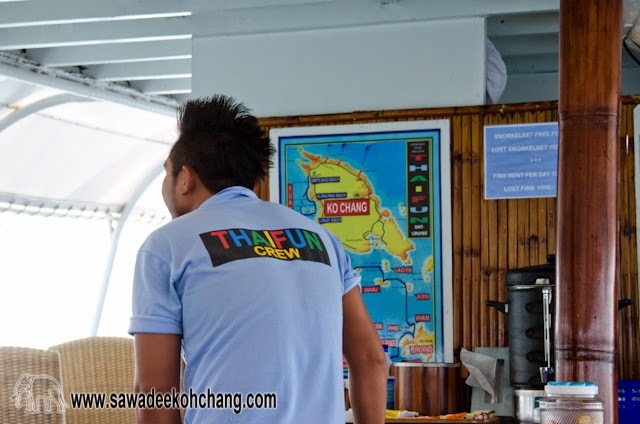 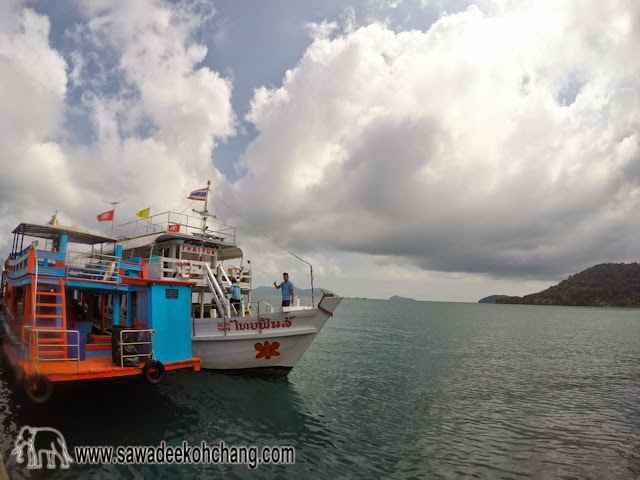 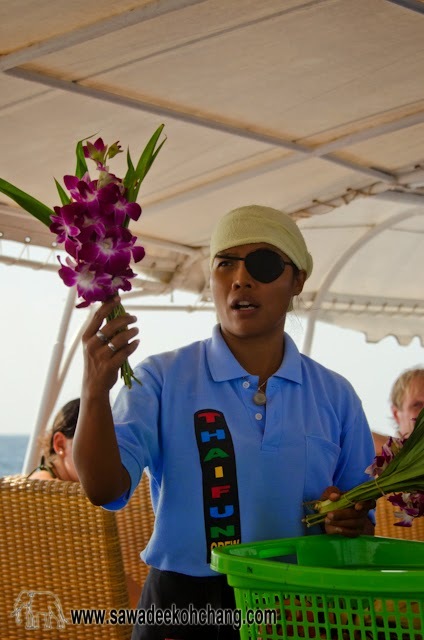 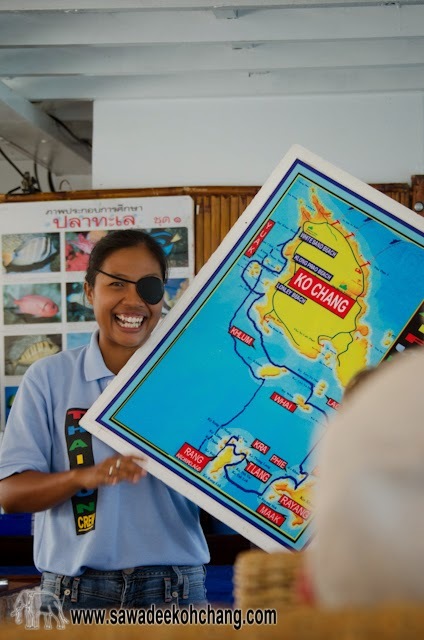 While they are bringing onboard all the guests from the different beaches of Koh Chang, Noknoi who is like the second captain of the boat, will give you different details about the trip and she will also entertain you all the day. 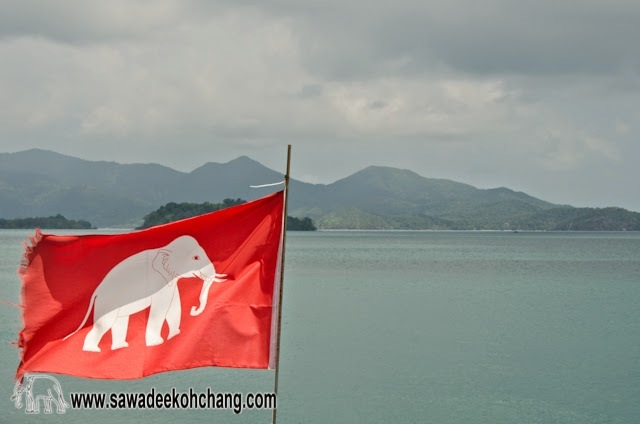 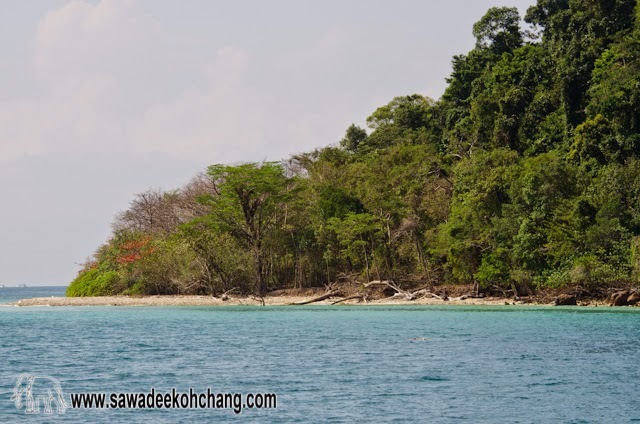 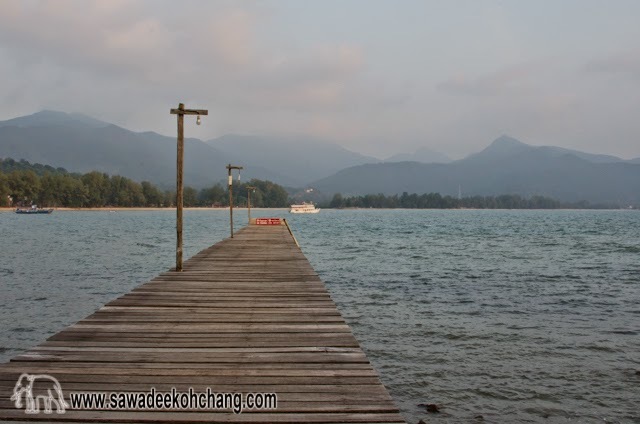 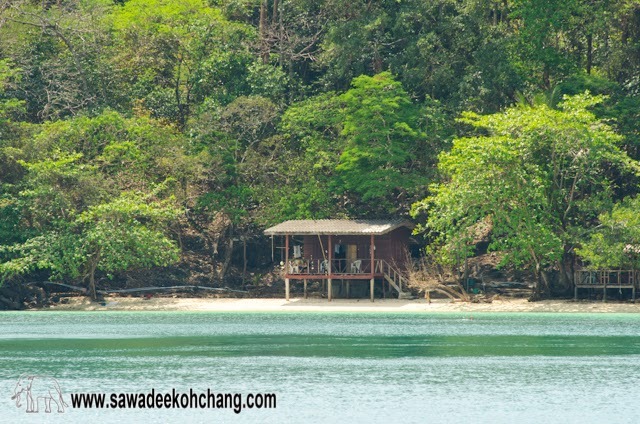 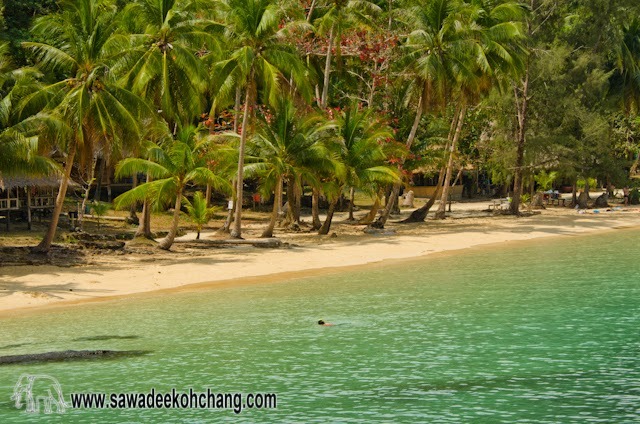 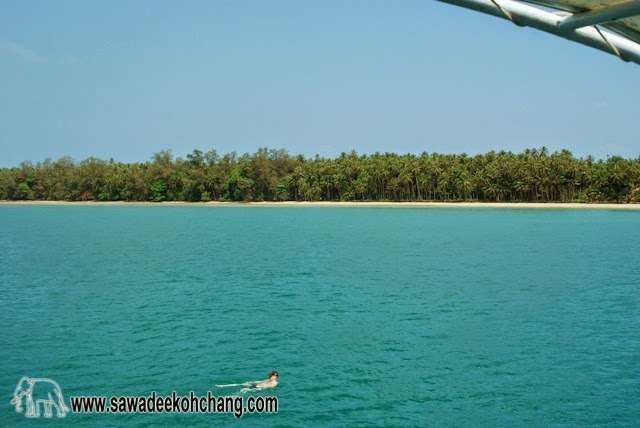 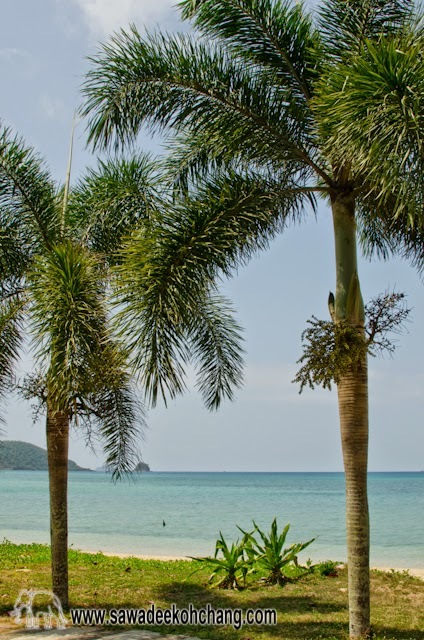 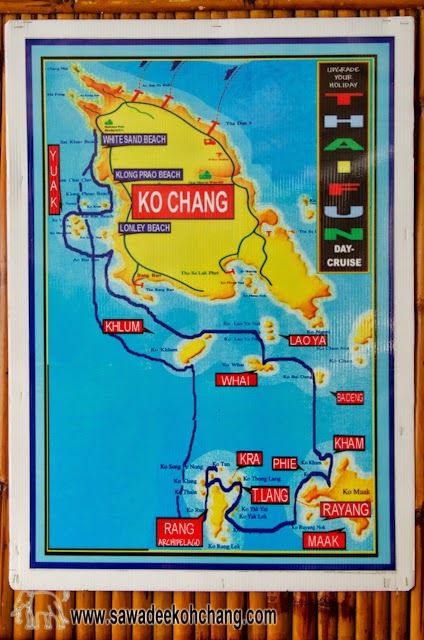 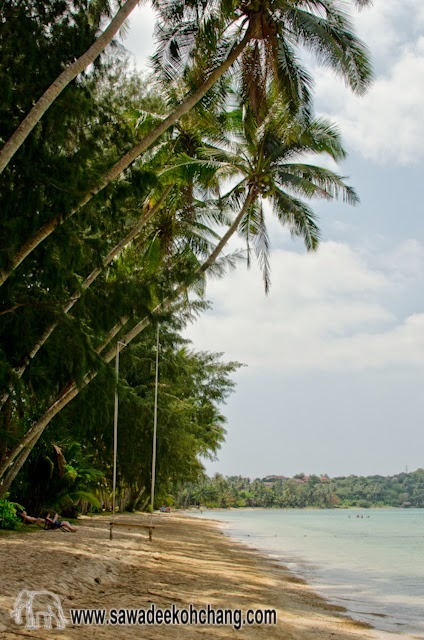 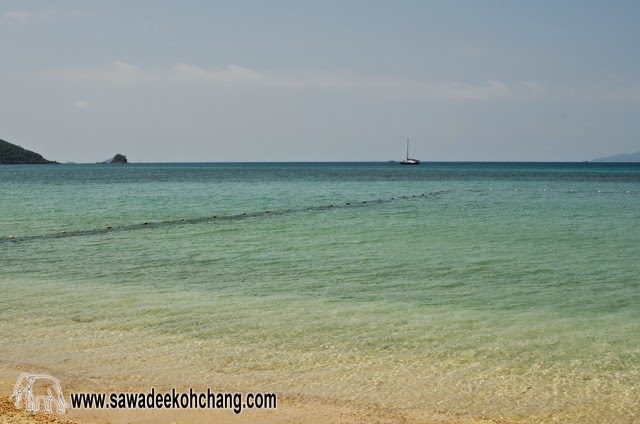 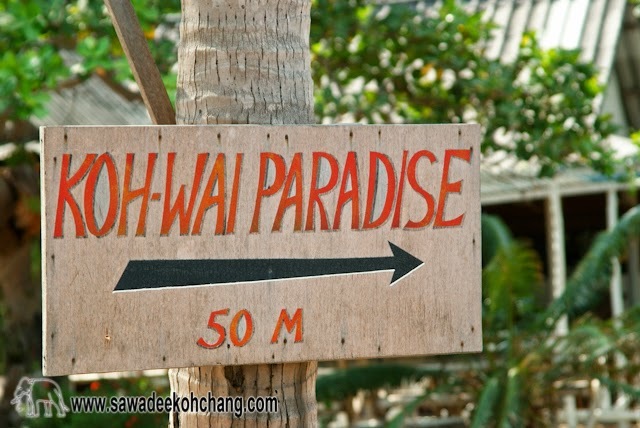 The road trip may change depending of the weather but the first stop will be at Koh Wai, a tiny paradise. 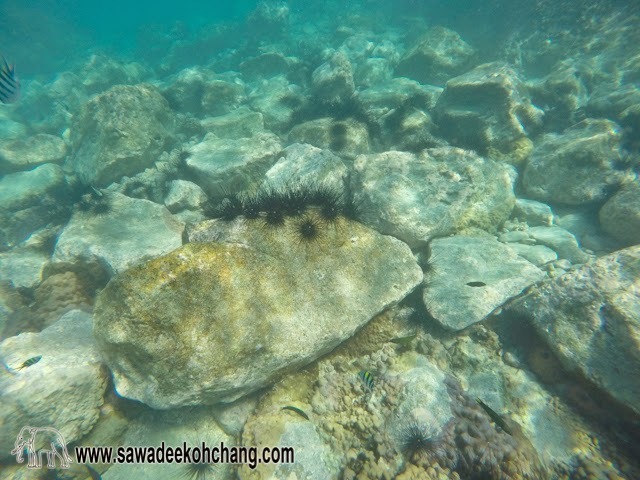 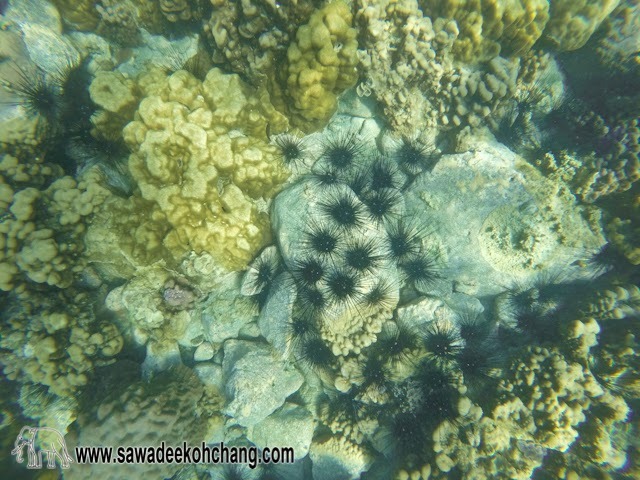 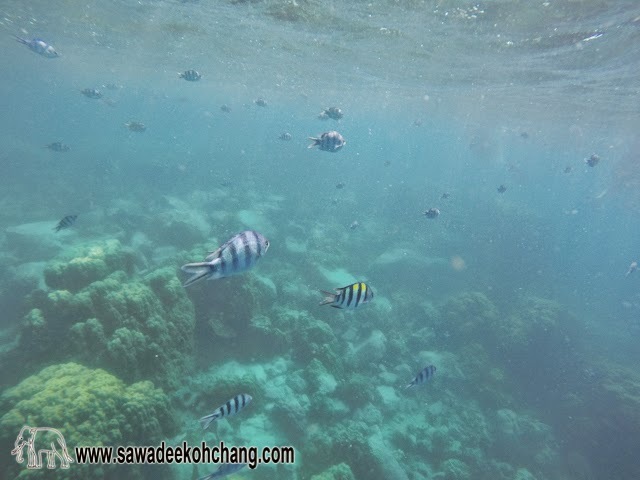 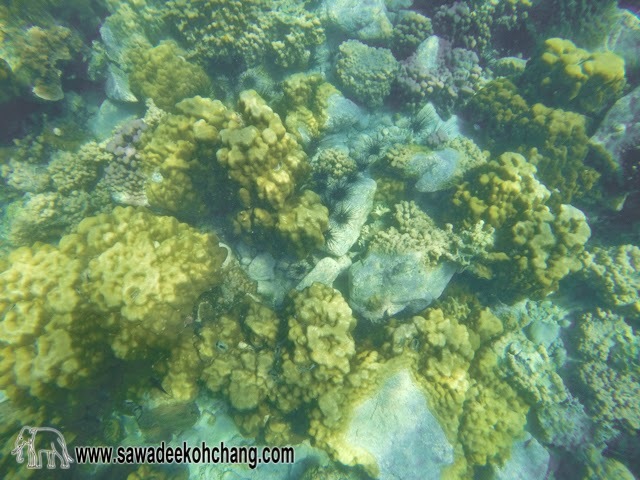 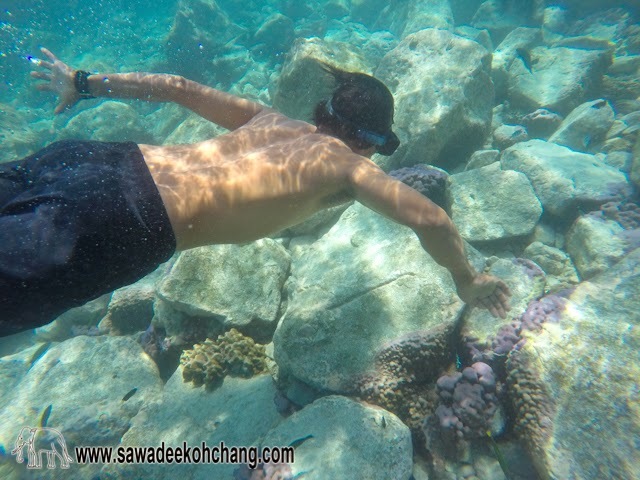 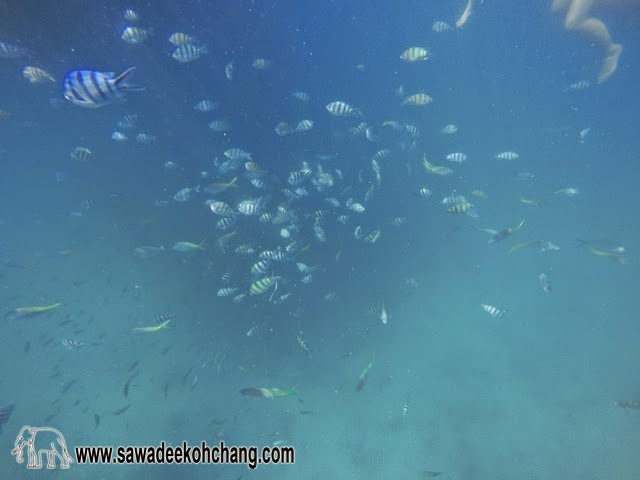 You will be able to snorkel and see beautiful sea creatures. 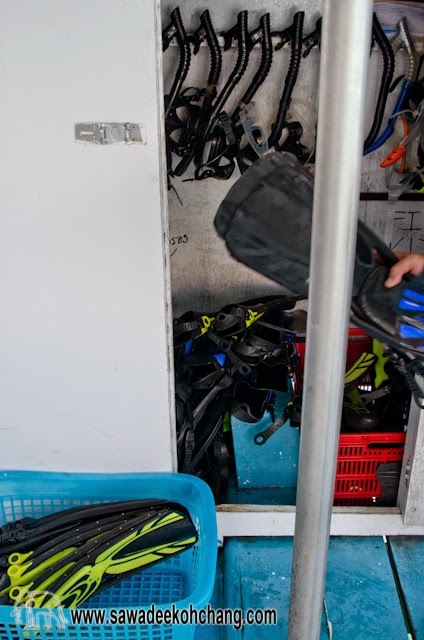 You can rent snorkels, masks and fins into the boat for a reasonable price. 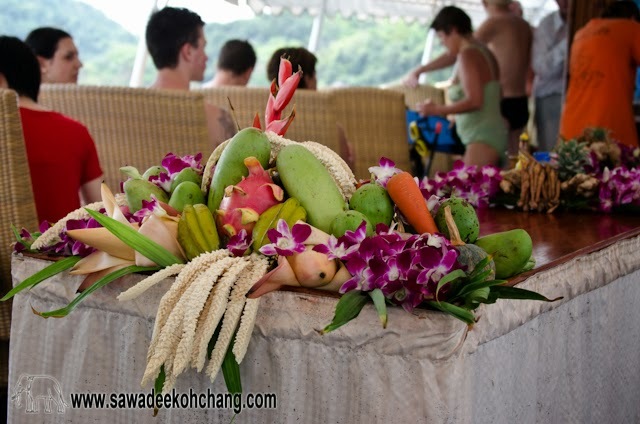 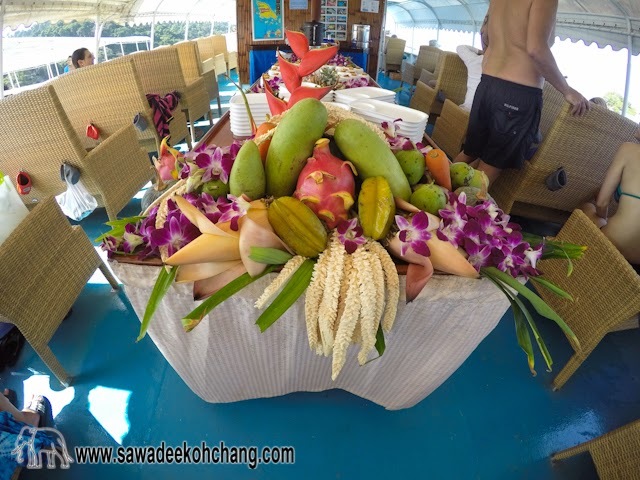 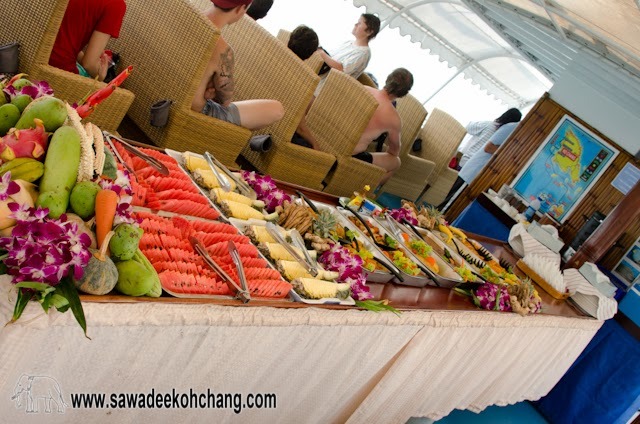 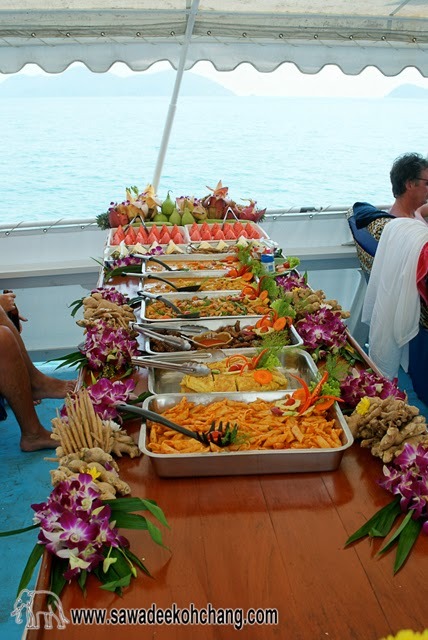 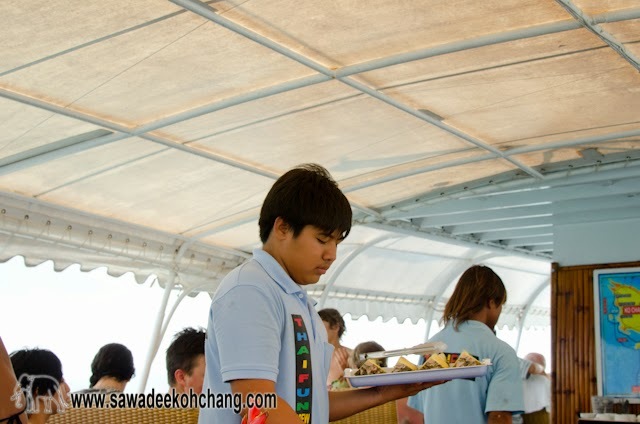 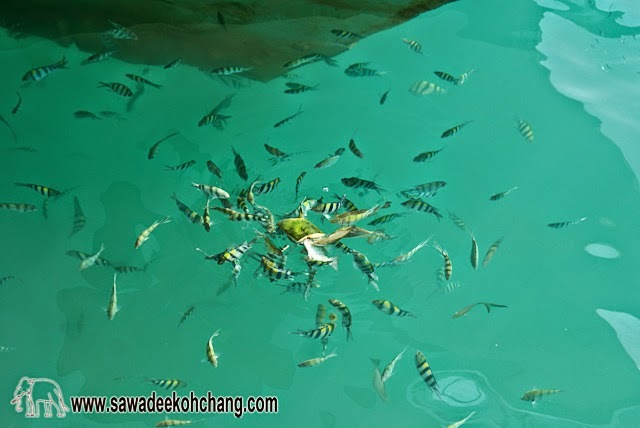 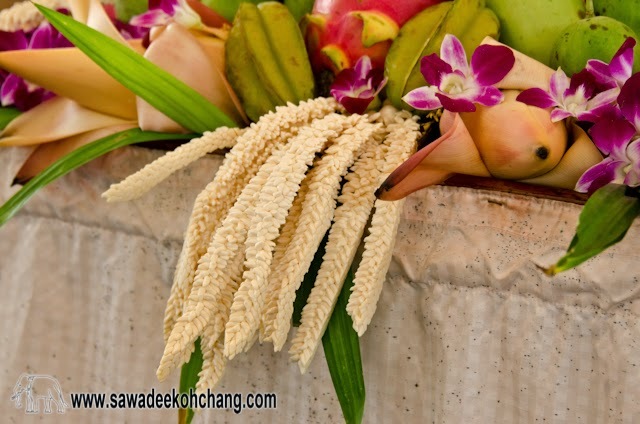 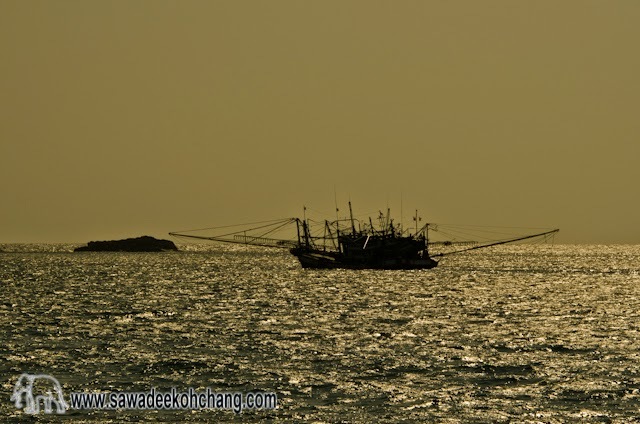 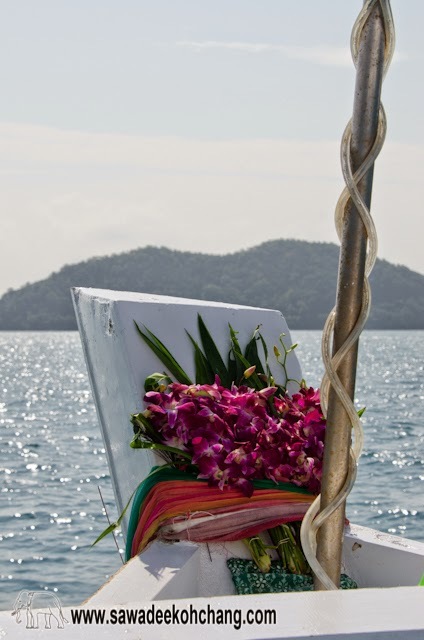 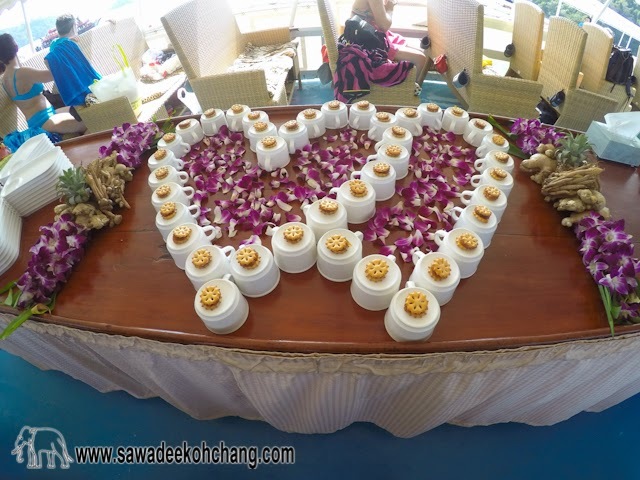 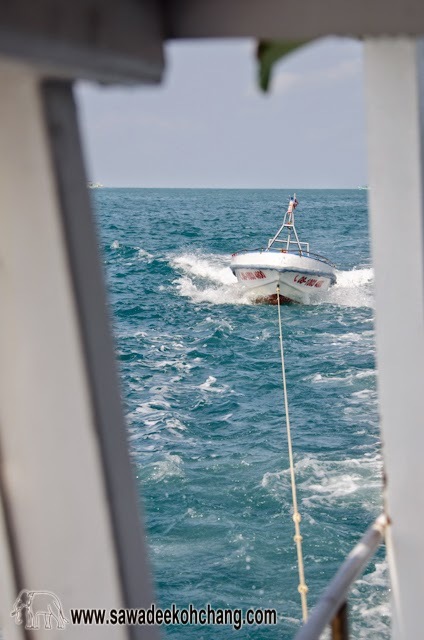 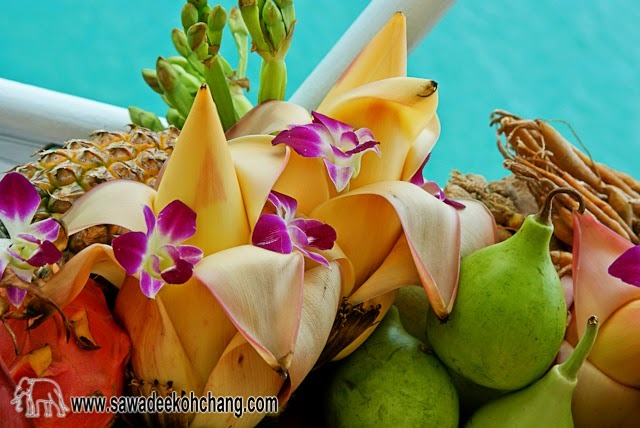 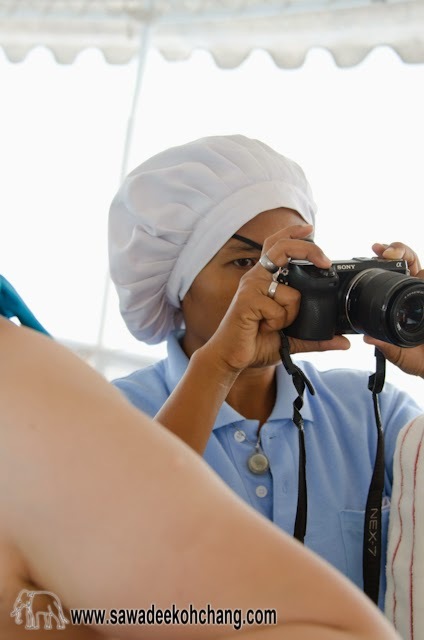 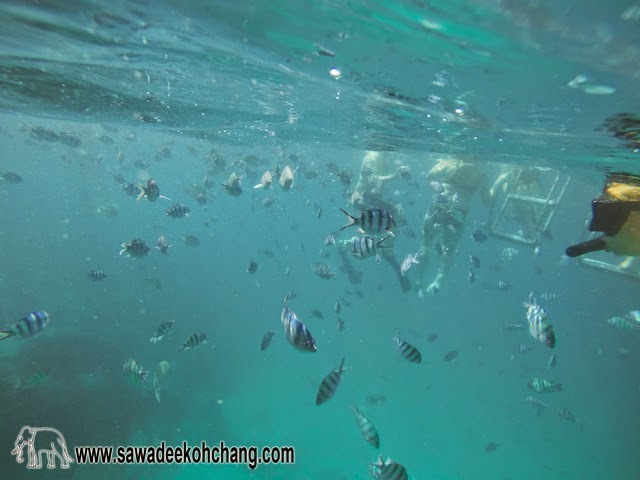 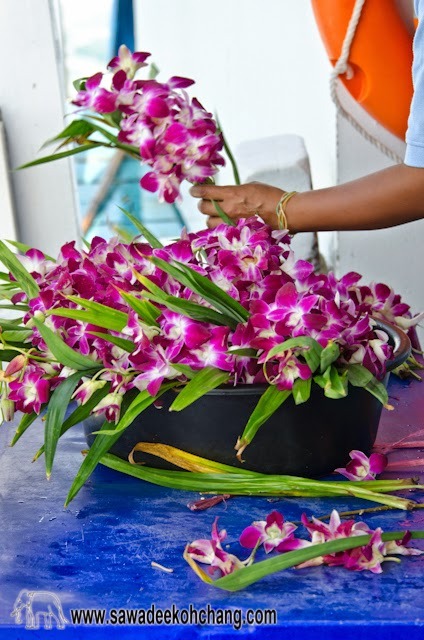 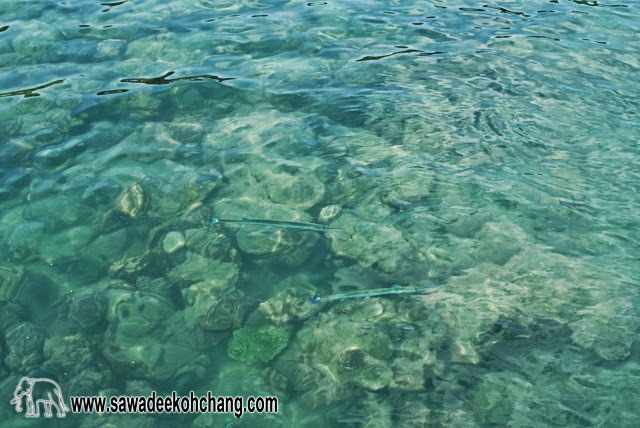 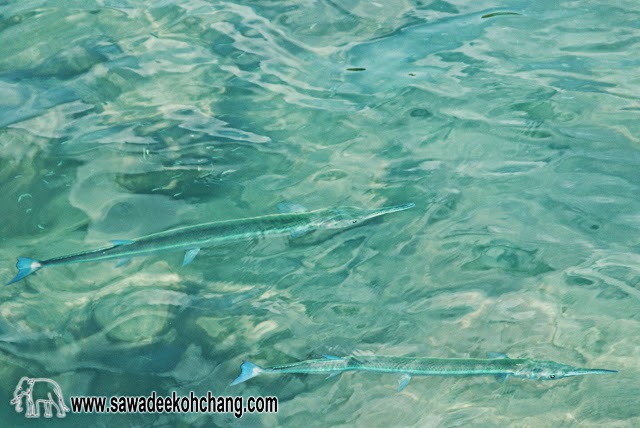 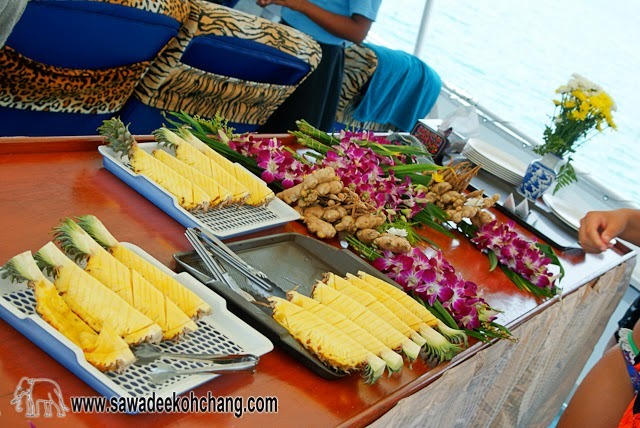 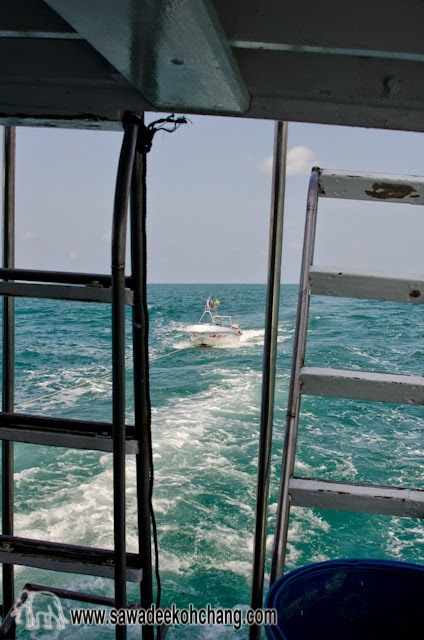 During the time you are discovering the sea-life of Koh Wai, the crew will prepare the lunch. 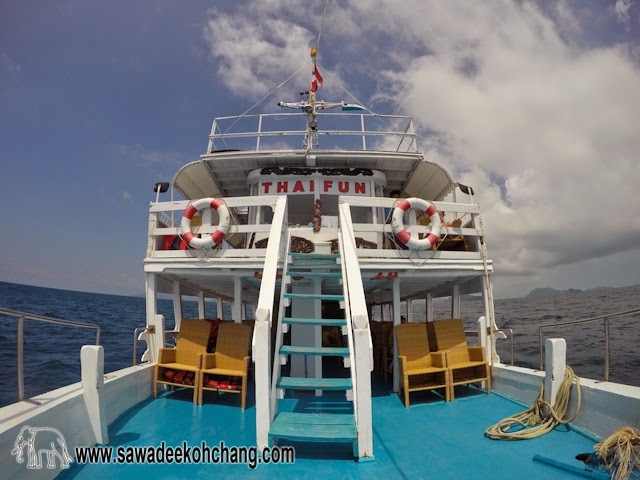 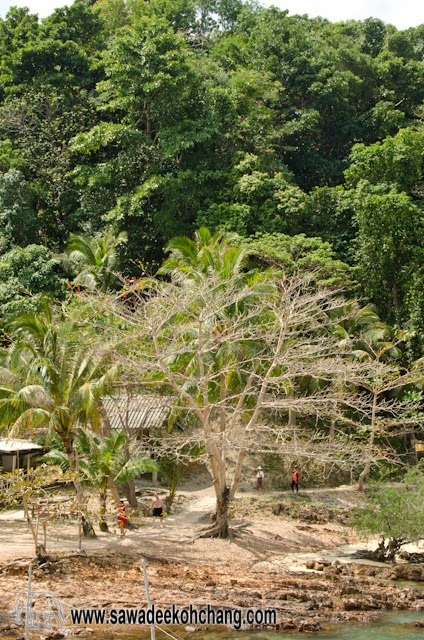 Going to the second stop, you will enjoy the lunch which is included to the trip (only fins rental, national park fee and beverages are not included). 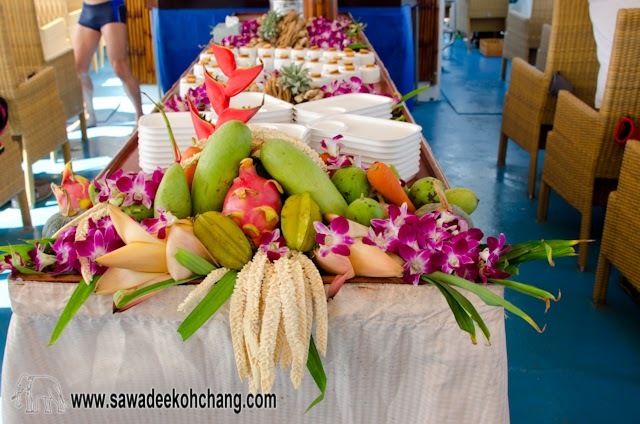 The lunch itself is delicious with a large choice of food and a beautiful decoration made of exotic fruits, vegetables and flowers. 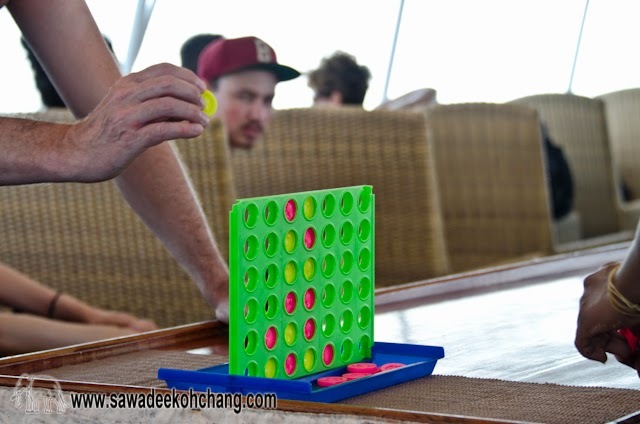 On the second stop you will have time to digest and have fun by jumping from the different decks. 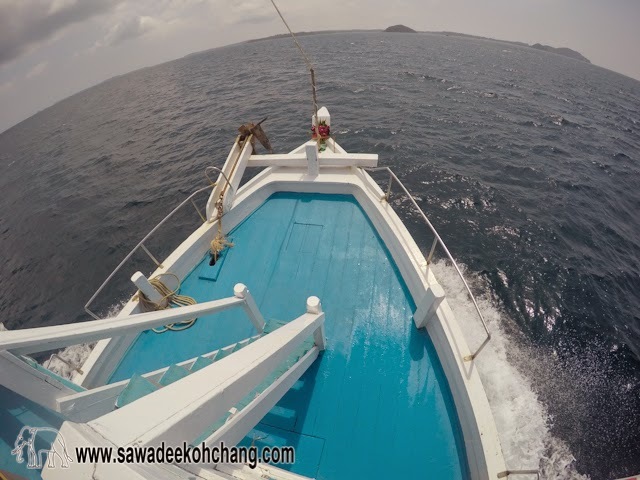 Kids or adults, all will also have a lot of fun to use the slide at the back of the boat. 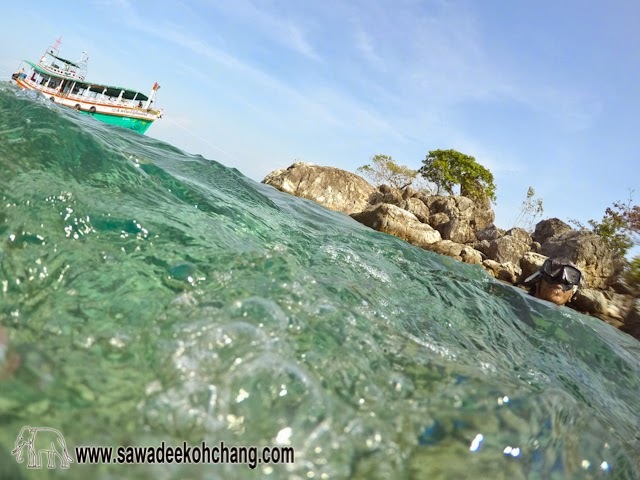 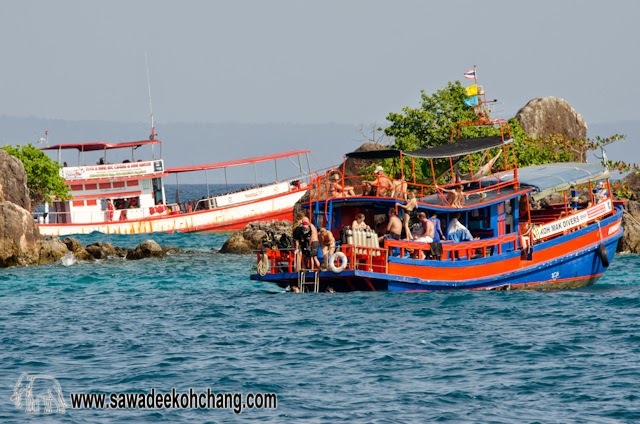 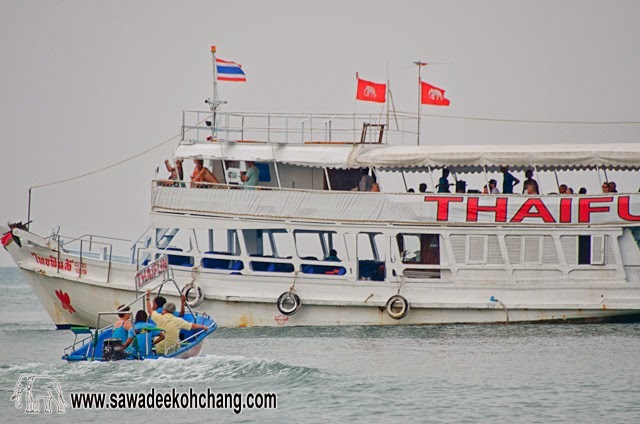 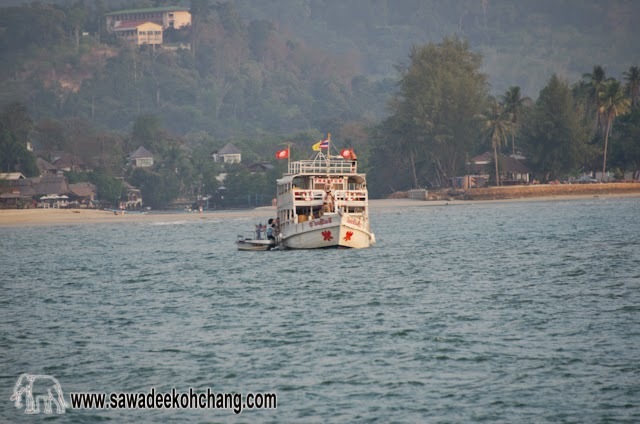 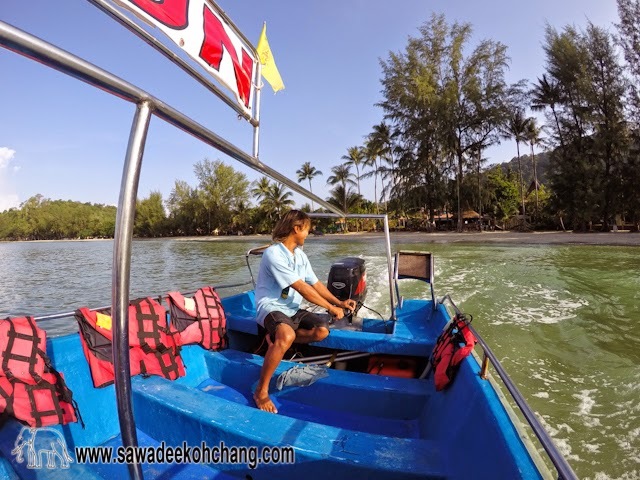 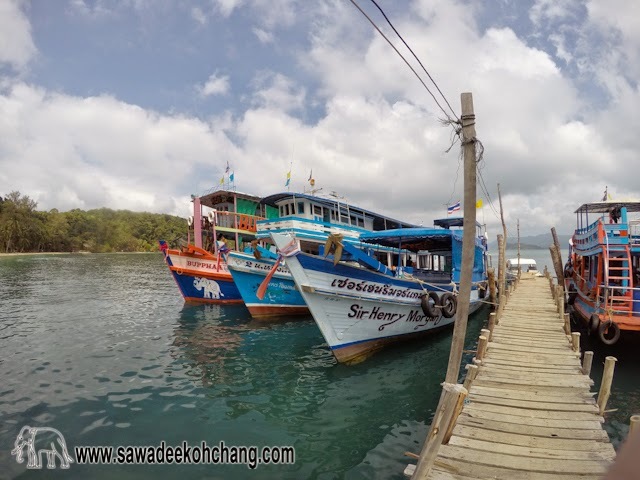 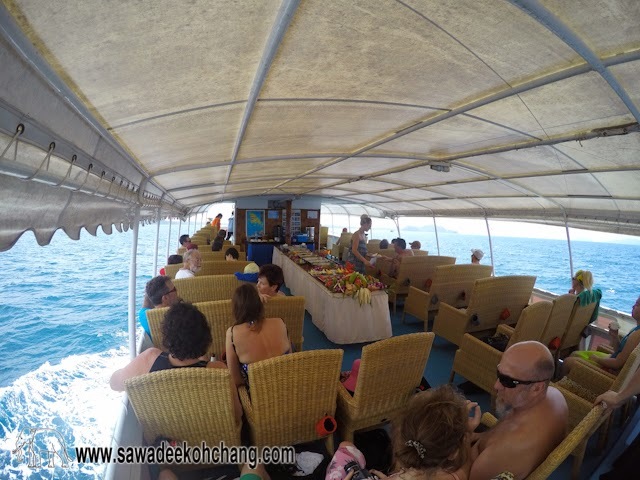 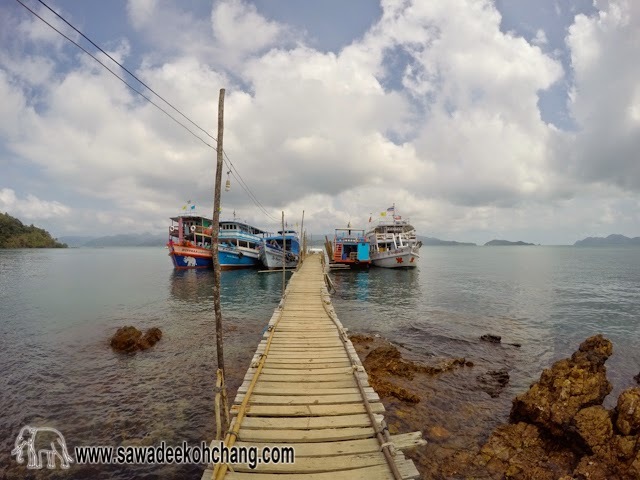 The boat will moor between Koh Kham and Koh Mak and if you want to spend a short time on the beach of Koh Mak the crew will bring you there. 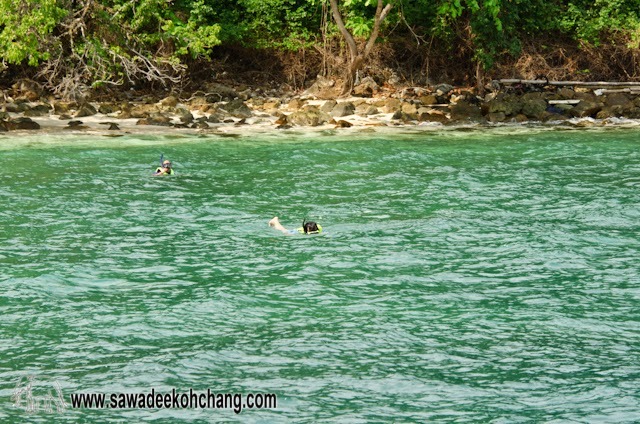 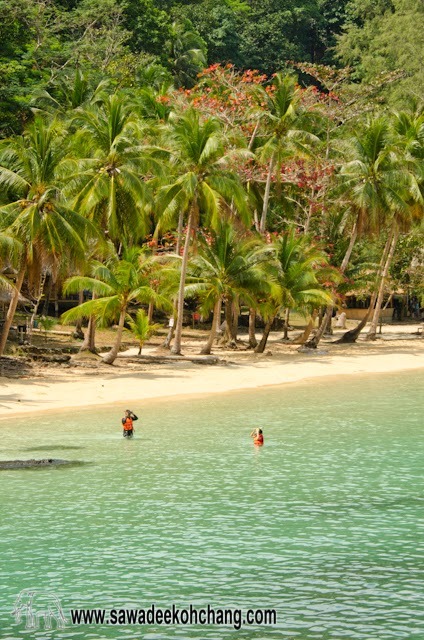 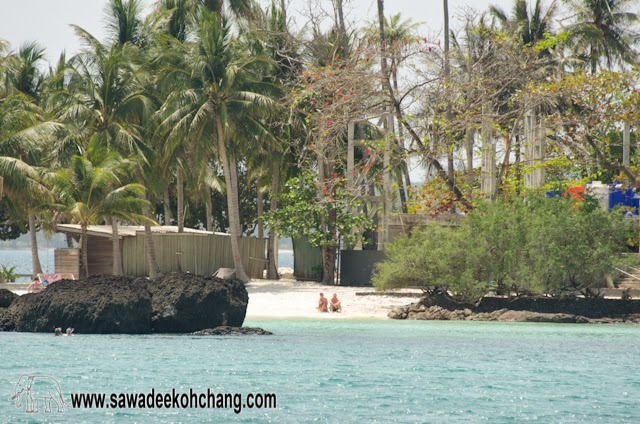 You will have about 45 minutes to enjoy the crystal clear water and the thin white sand. 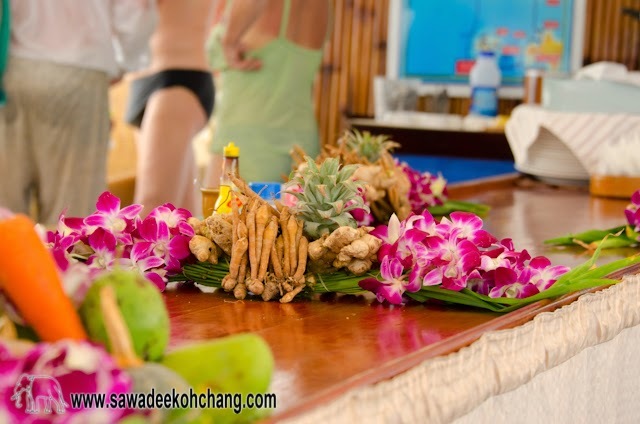 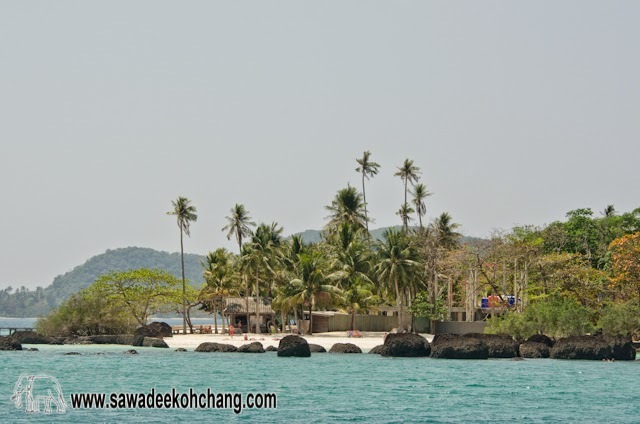 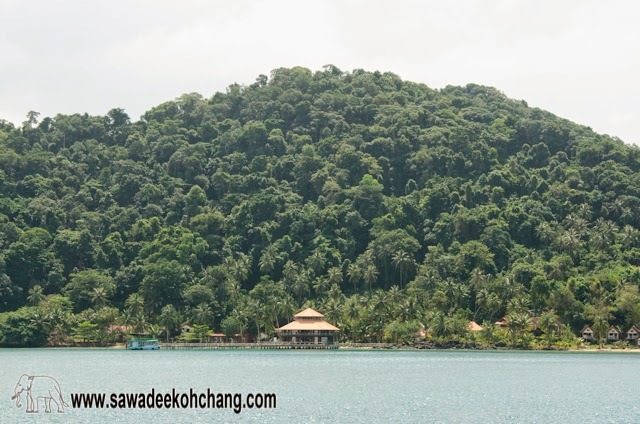 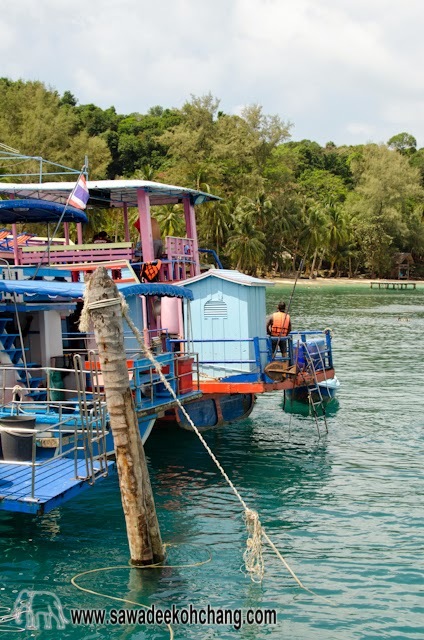 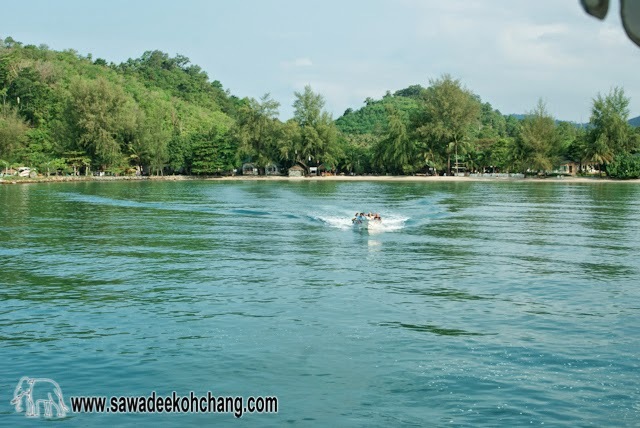 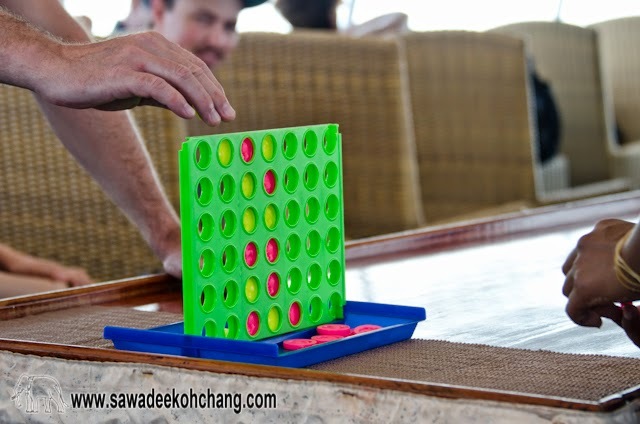 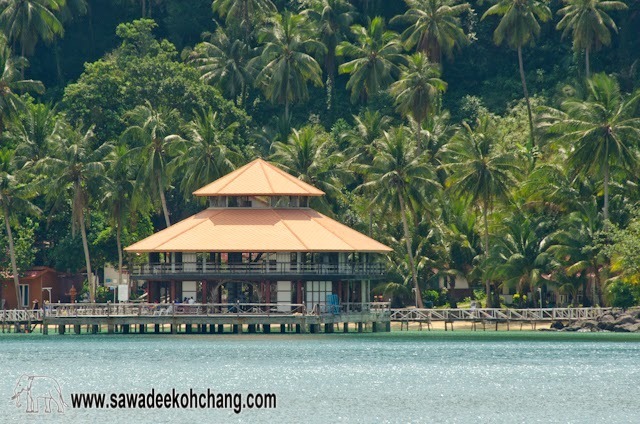 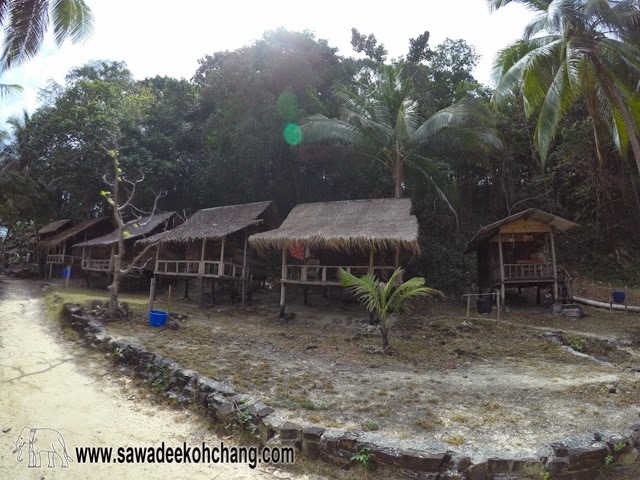 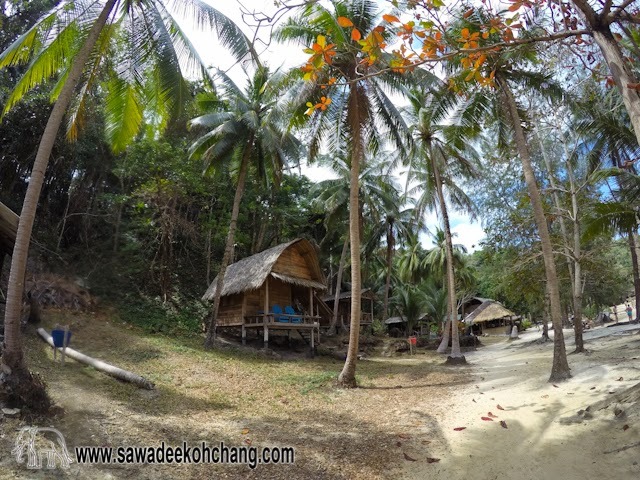 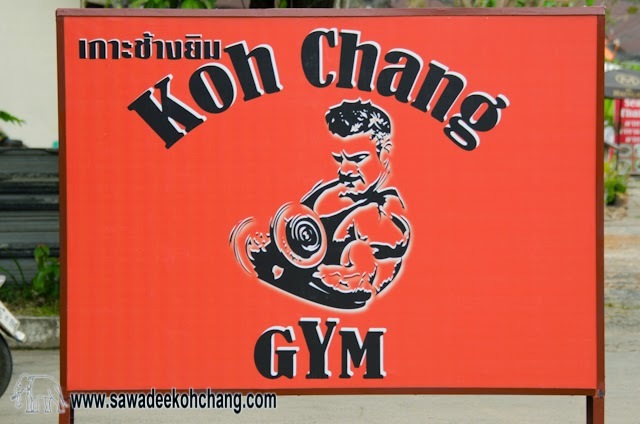 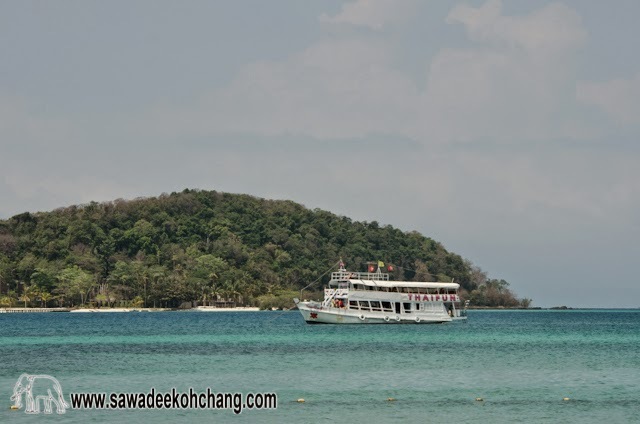 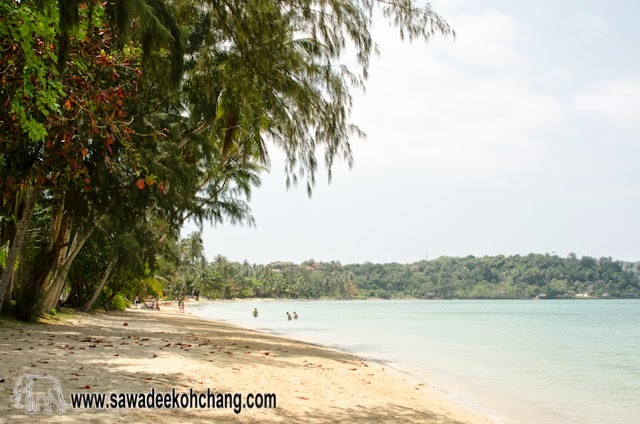 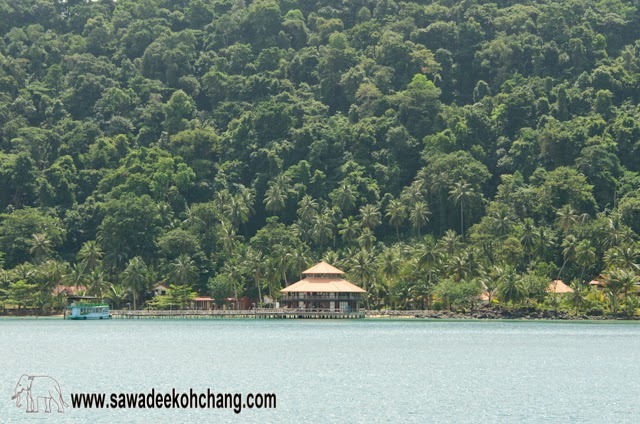 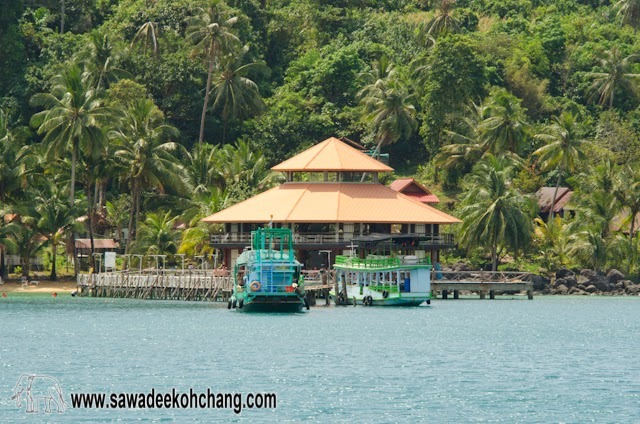 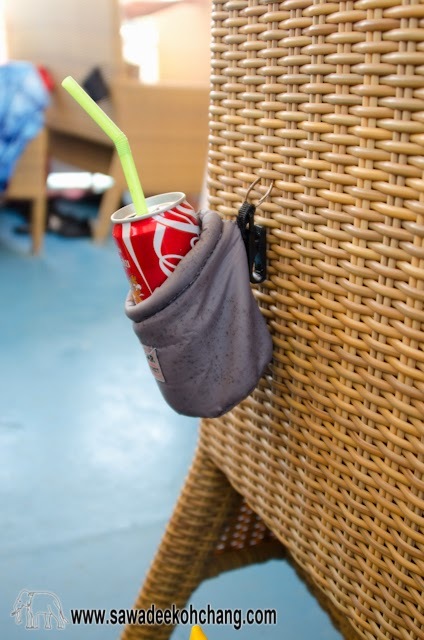 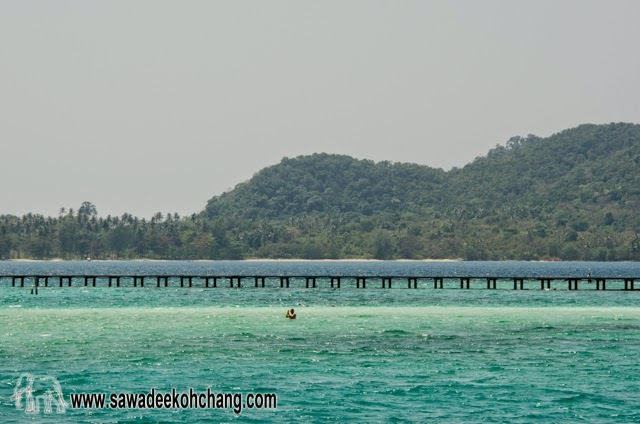 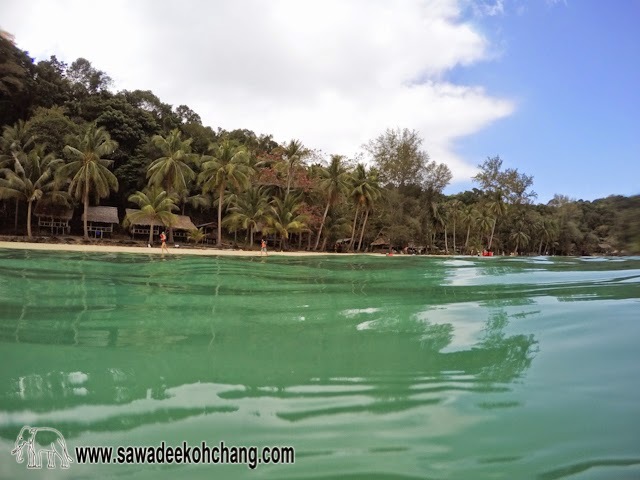 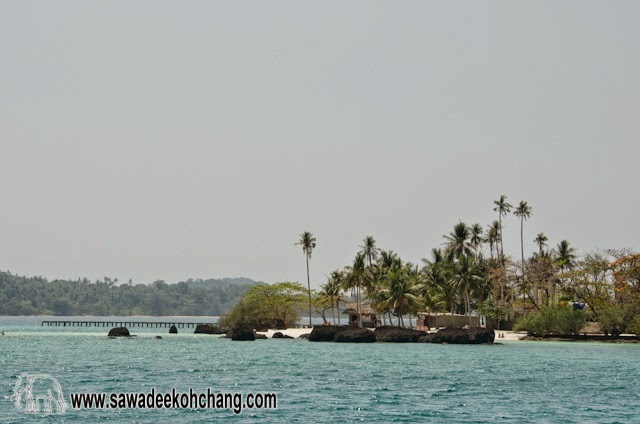 You can also have a drink or exchange money at Koh Mak Resort. 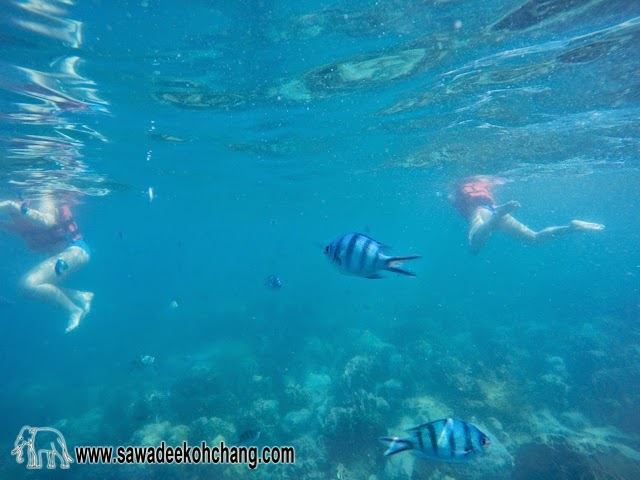 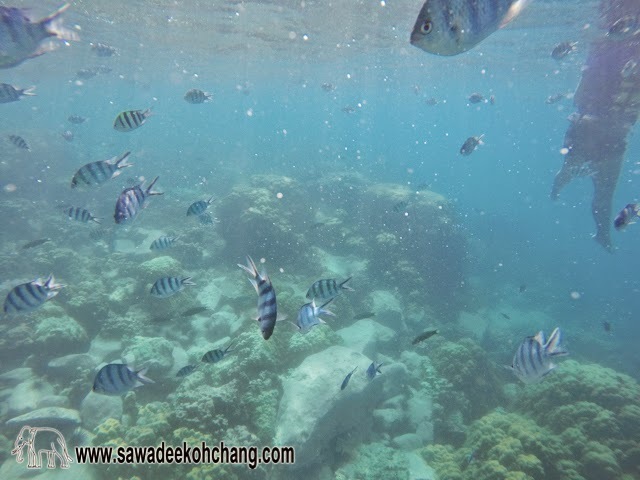 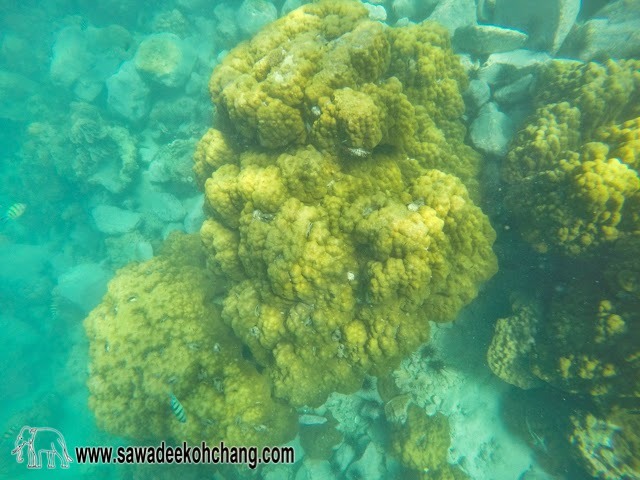 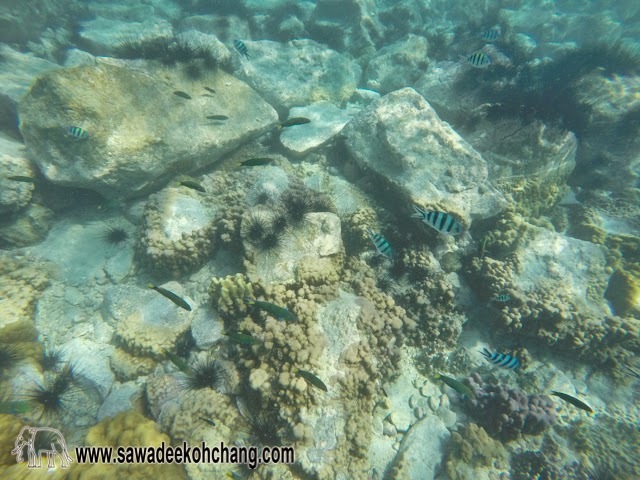 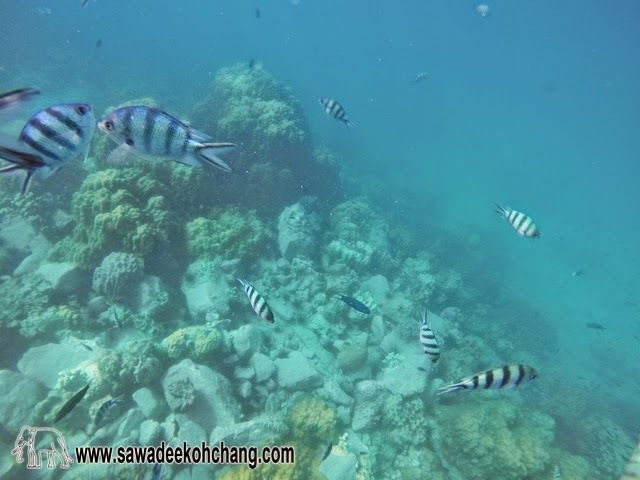 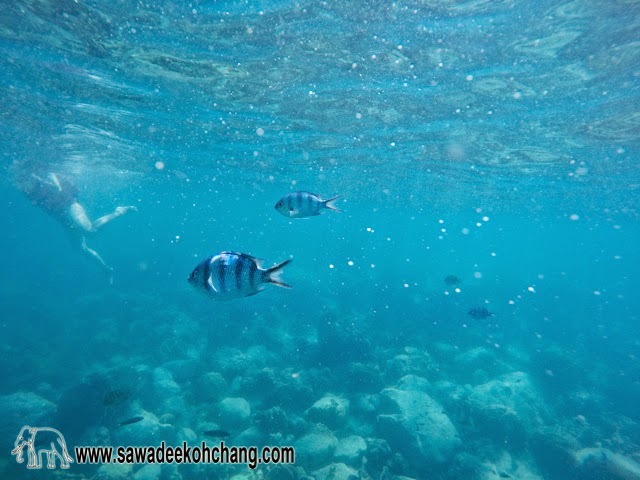 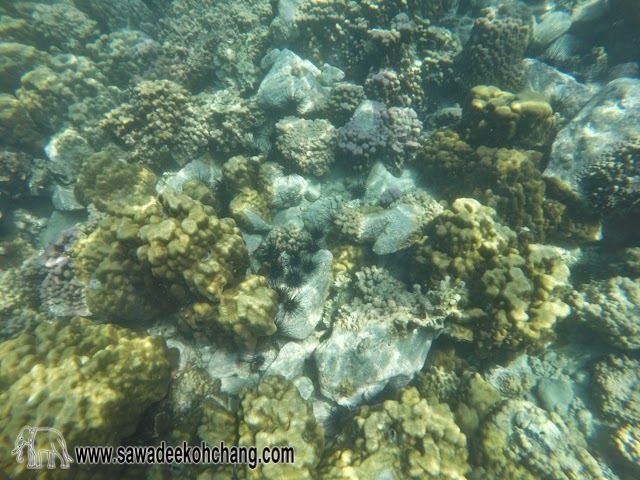 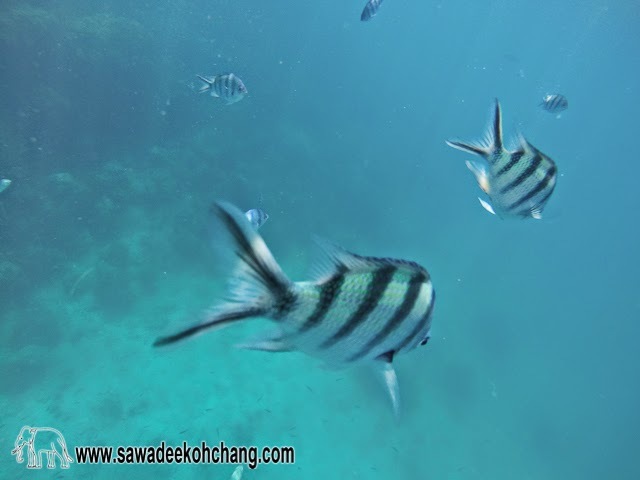 At the third stop you will snorkel again and see much more beautiful fish and coral than the first stop. 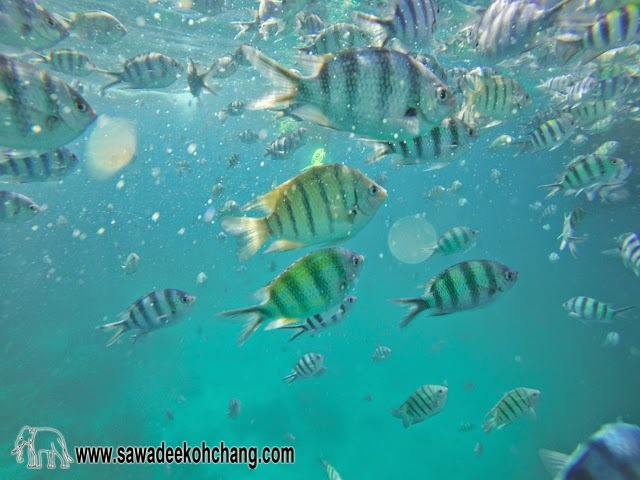 You will feel like being in a giant aquarium. 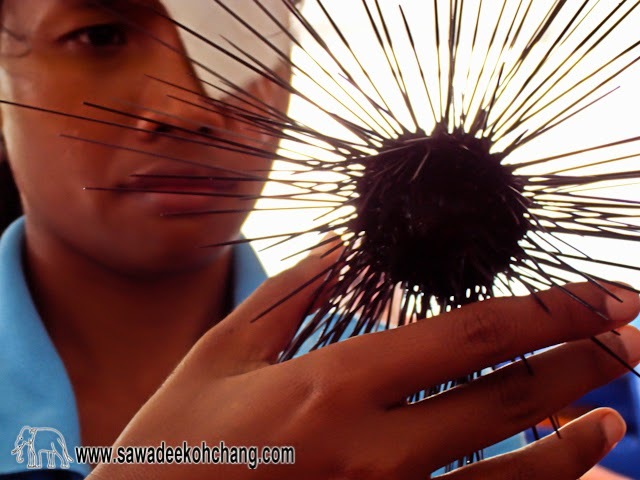 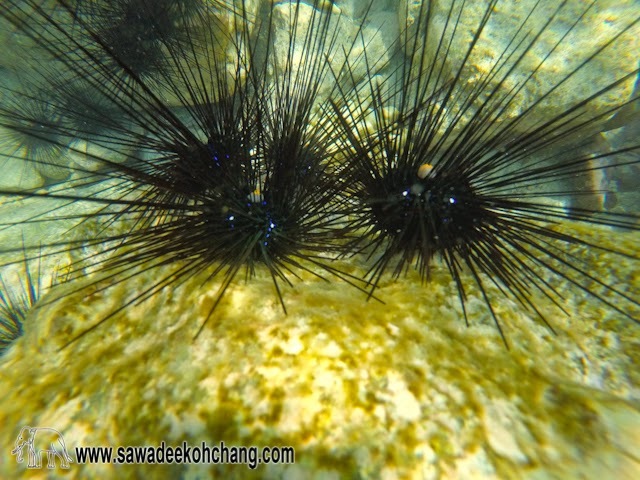 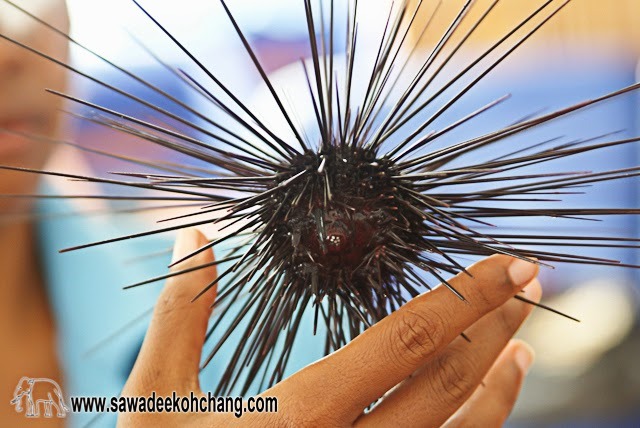 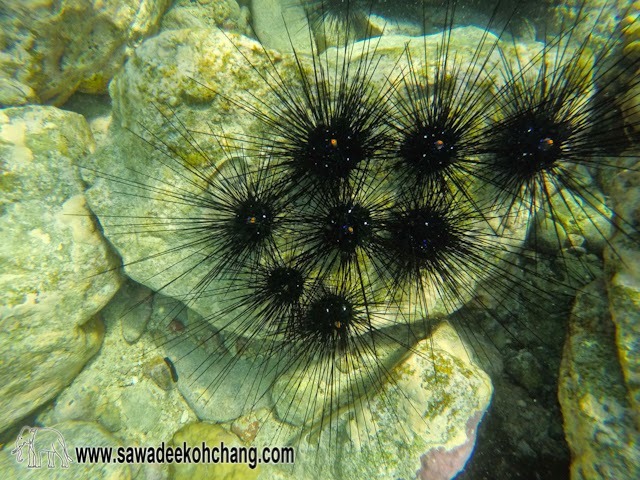 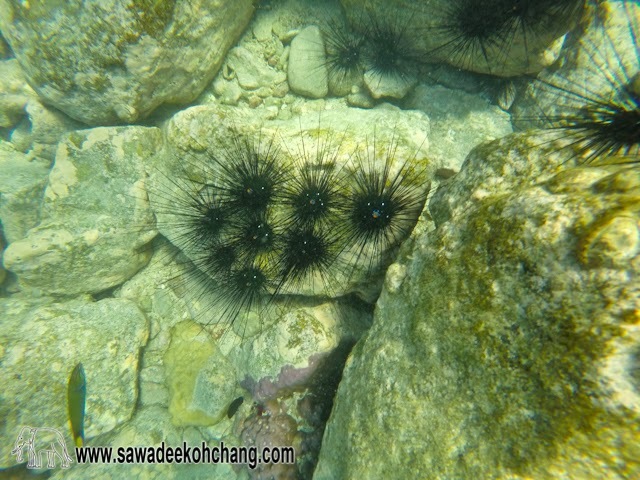 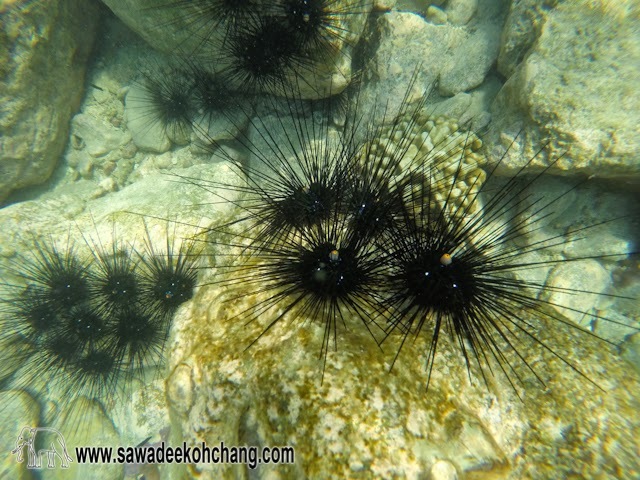 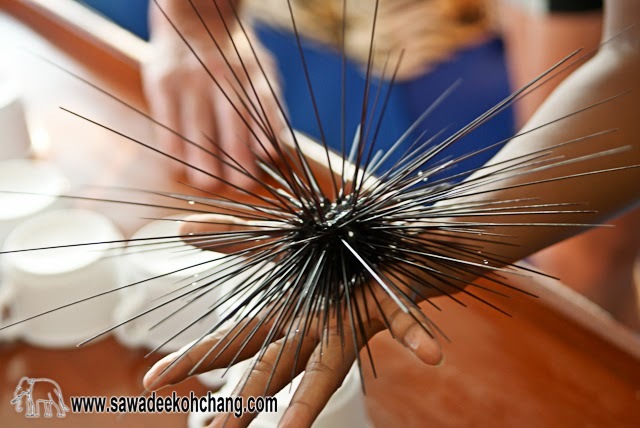 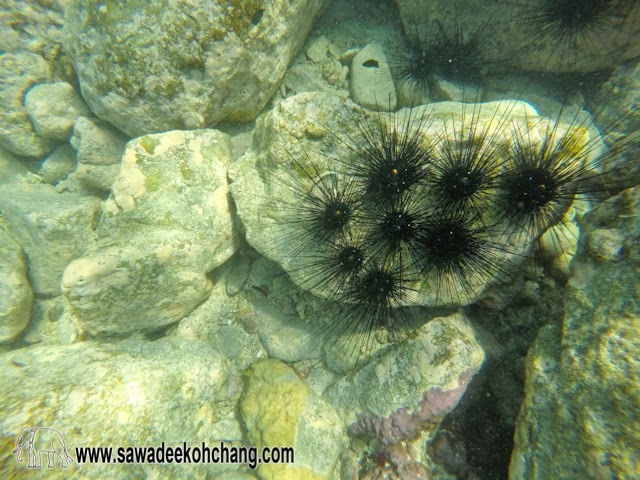 Be careful with the sea ​​urchins, they have very long and painful needles. 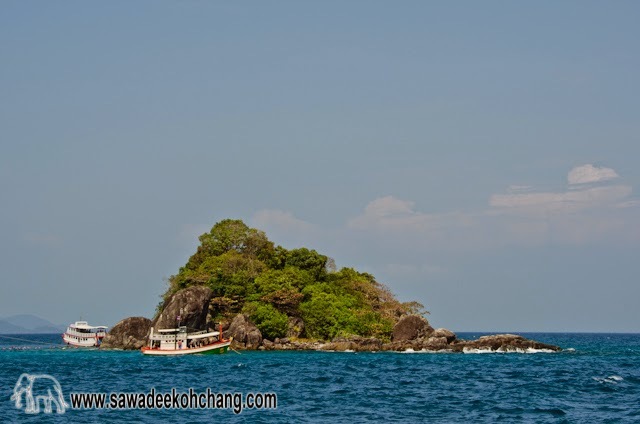 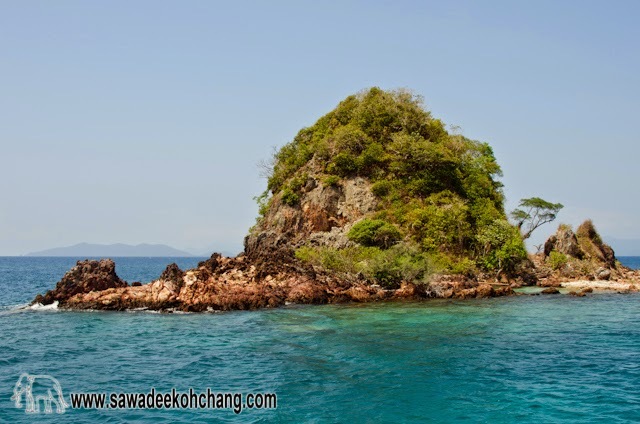 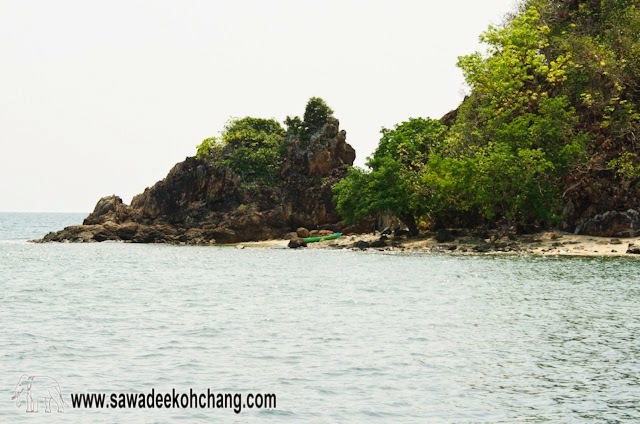 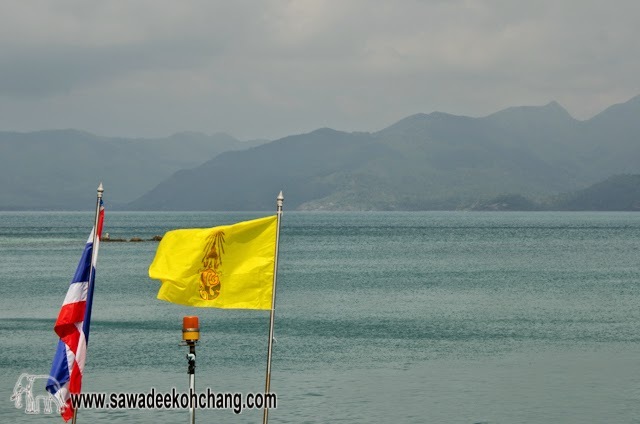 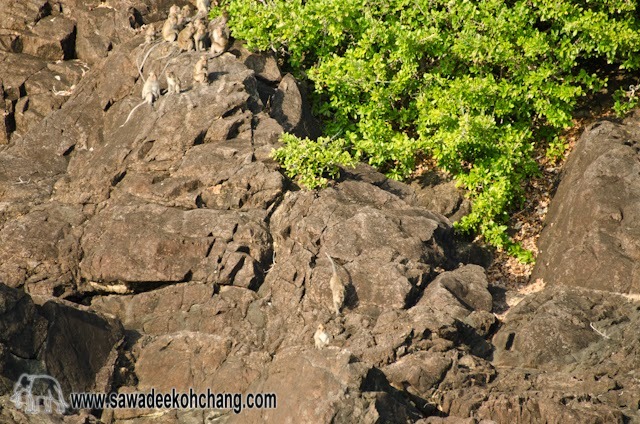 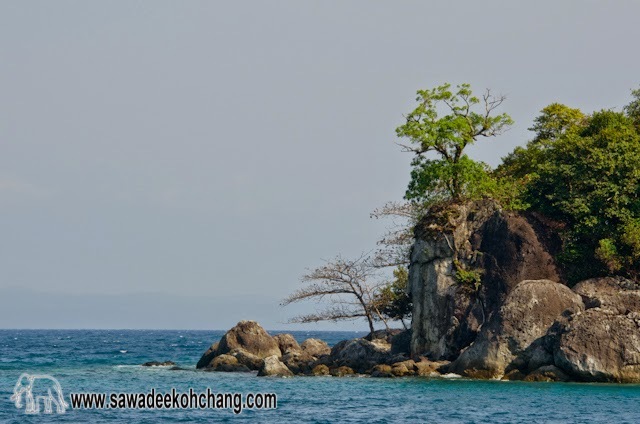 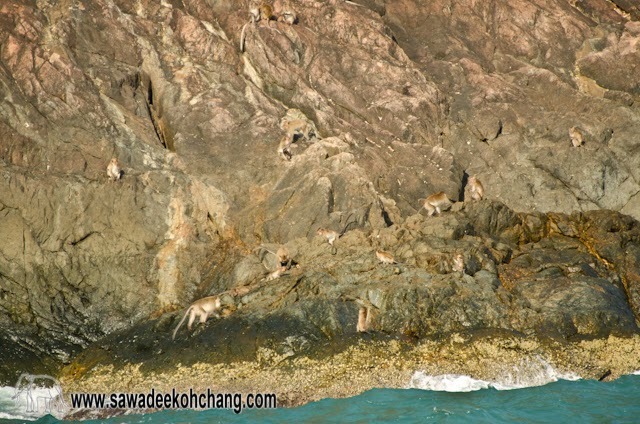 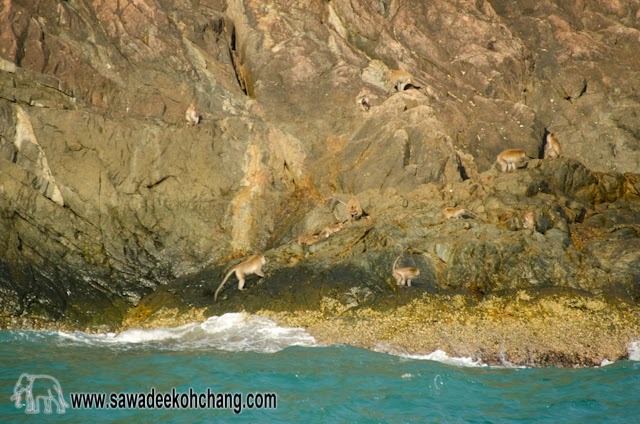 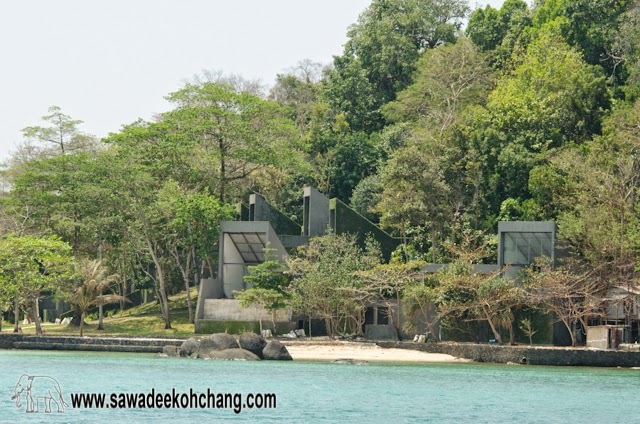 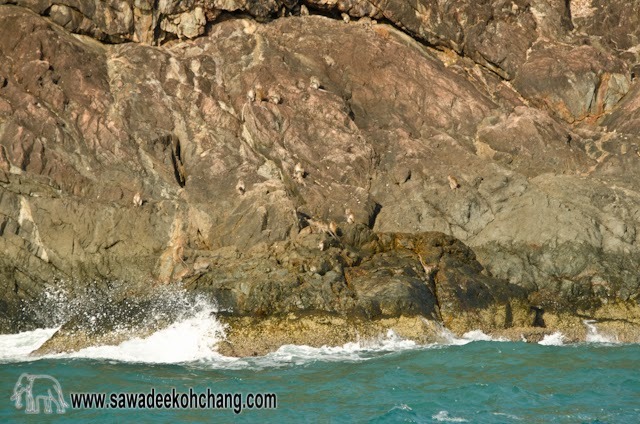 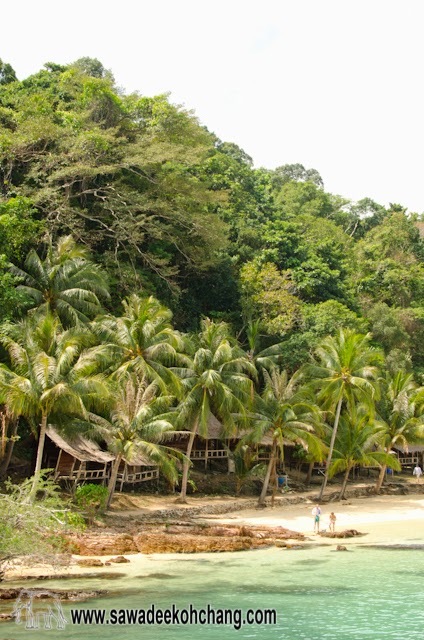 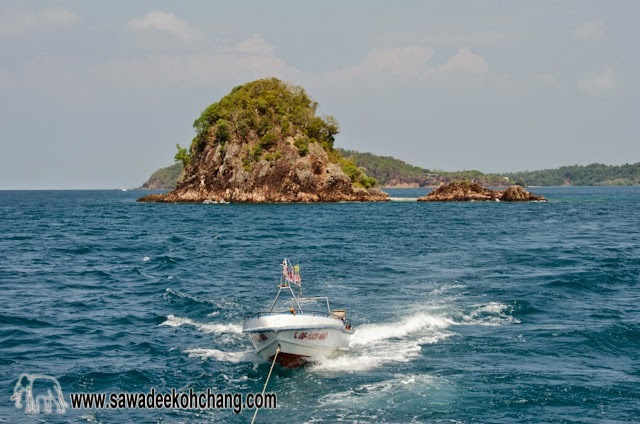 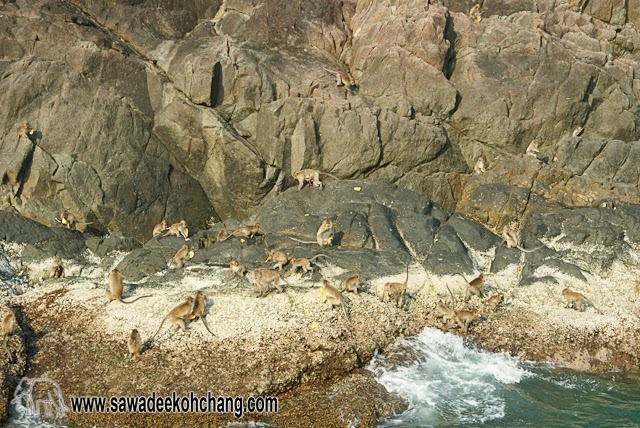 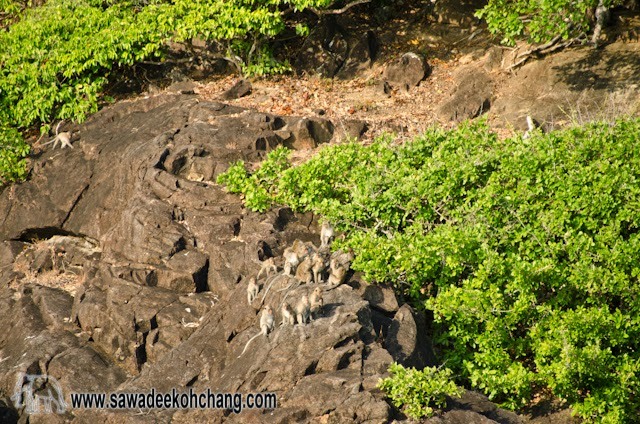 It will then be time to go back to Koh Chang but before arriving you will have a last stop at the monkeys cliff. 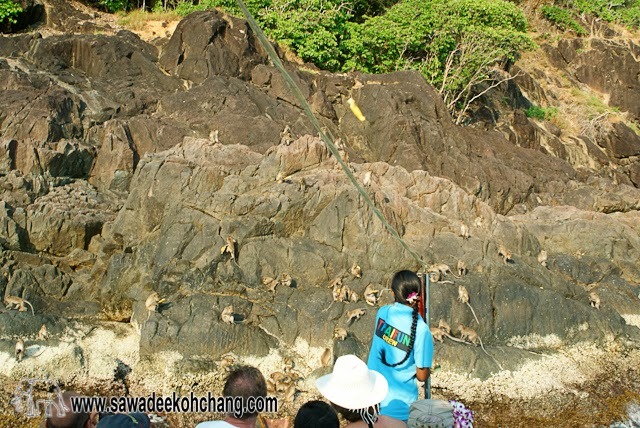 Noknoi will call her friends the monkeys which have been already waiting for you. 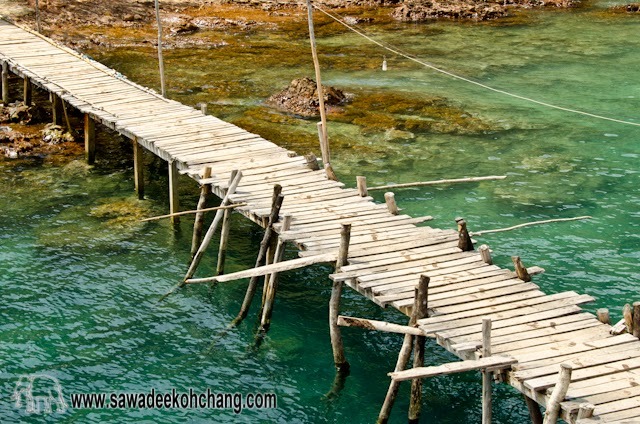 And you will wonder who is the attraction, the monkeys or you? 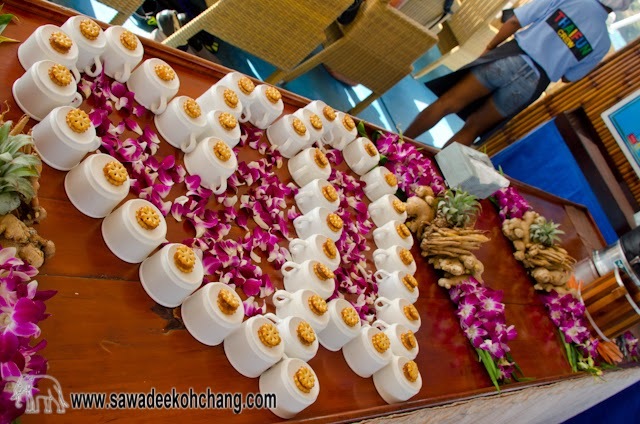 Tea or coffee with the delicious home made banana cake with cashew nuts (my favourite) will be available in the afternoon. 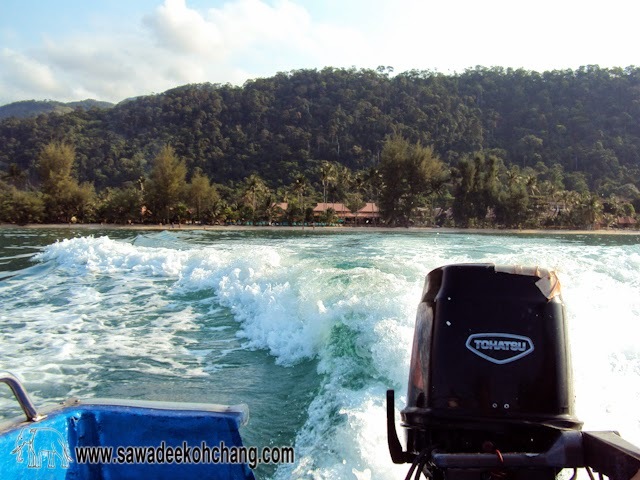 You will finally go back to your resort admiring the beautiful sunset and with your head full of souvenirs and hopefully in your camera too. 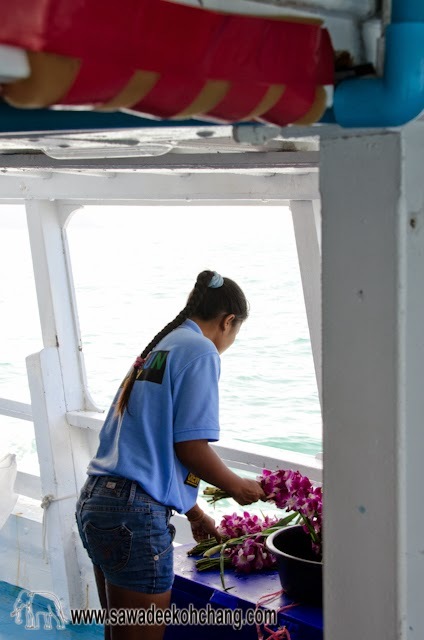 You will remember the crew for a very long time and realise that I was right, they are amazing people and this trip is something which must be done absolutely (if the weather is good of course).